Our house officially went on the market this week. We did a lot of work to get it picture perfect & ready for showings. We have been packing & cleaning around the clock for weeks. With all of the cleaning that we have been doing, I have gone through a lot of paper towels. I mean a lot. 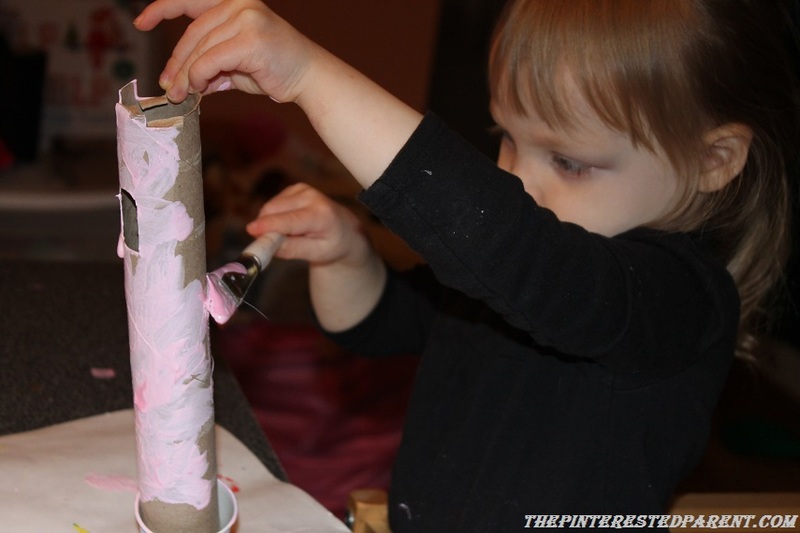 This left me with a lot of empty paper towel tubes & some crafting opportunities. 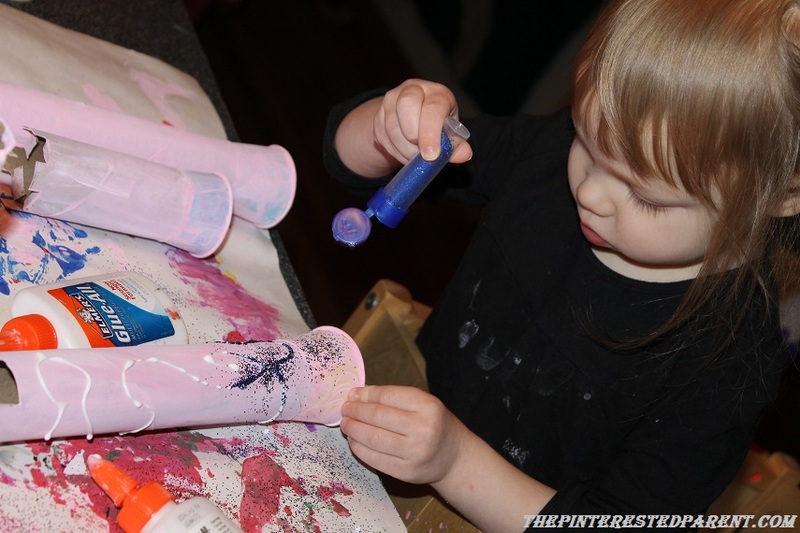 We worked on a couple of crafts this week to use up some of those empty tubes & here they are. 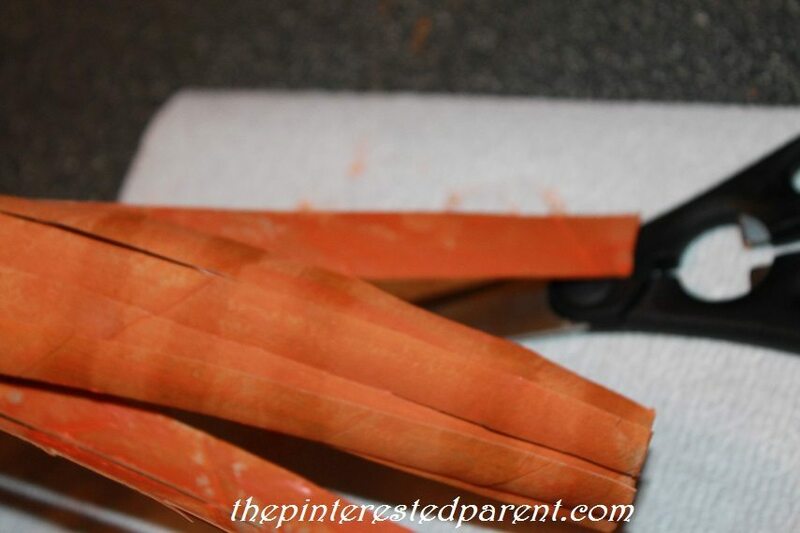 Paint an empty paper towel tube on the inside & out using the orange paint & then let it dry. 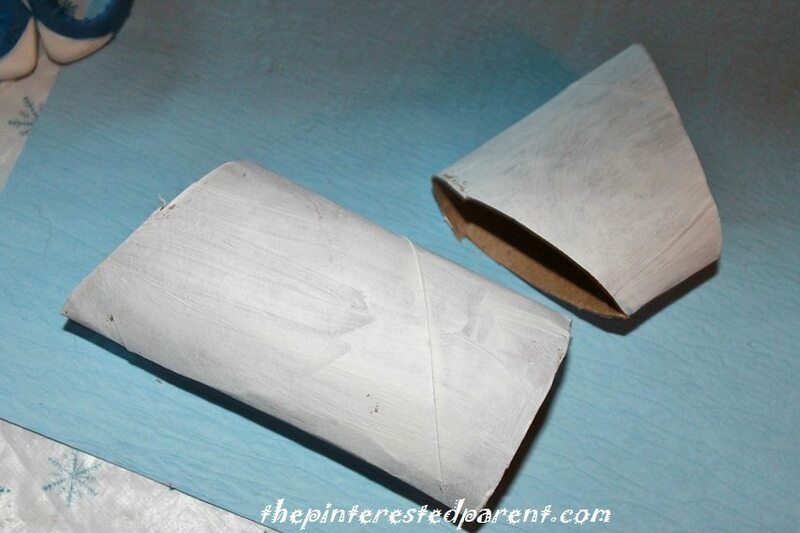 Cut a 3″ – 4″ piece of a toilet paper roll. 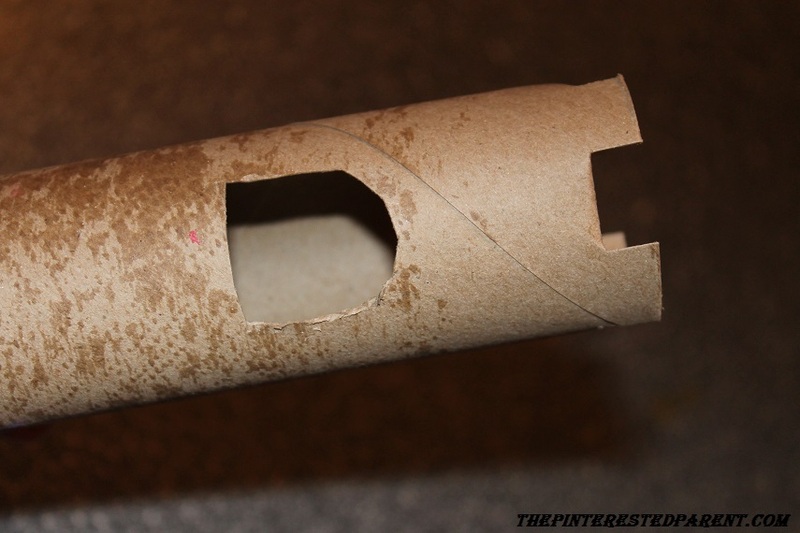 Cut the roll open & paint it green on both ends & let dry. 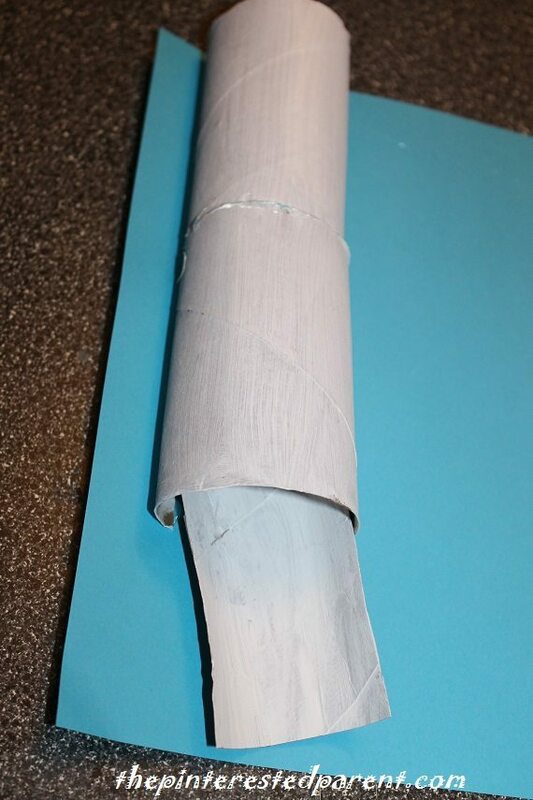 Cut around the paper towel roll forming 3/4″ strips about 3/4 of the way down. Round fold the strips starting from the cut end & tuck into the opposite end of the tube as shown. 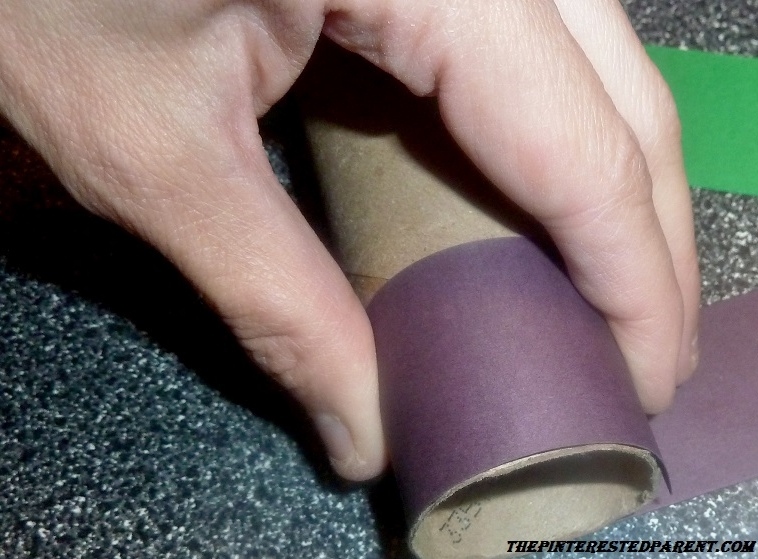 Roll the green tube up & stick in the opening on top. 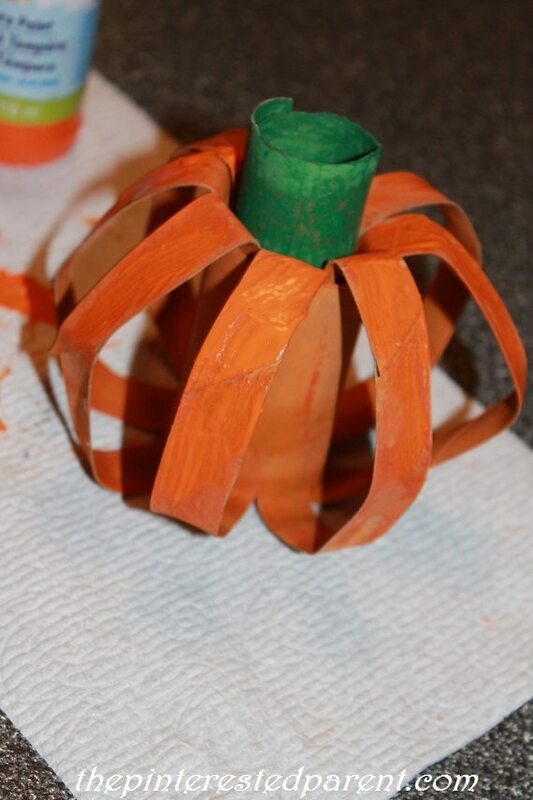 Add a little extra paint to your pumpkin if needed. 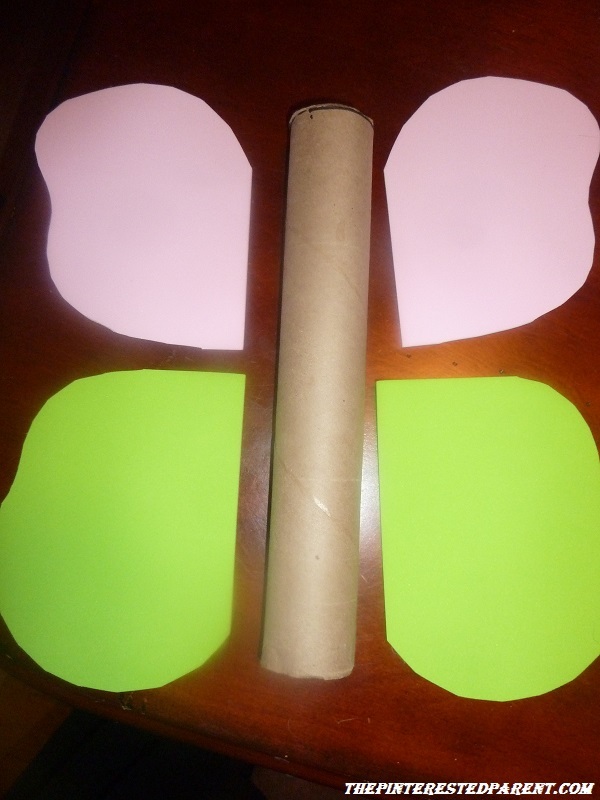 Cut leaves out of construction paper & glue them to the green roll. 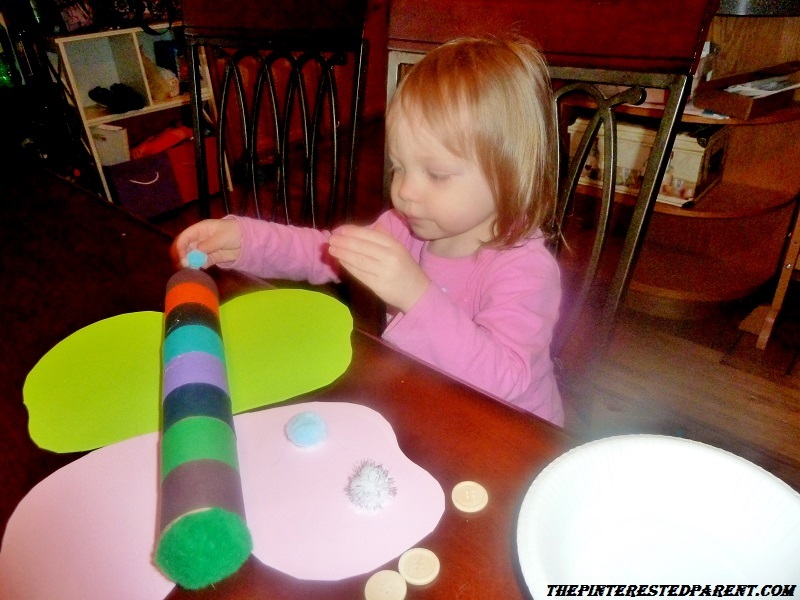 Cut a green pipe cleaner in half & roll into spirals. 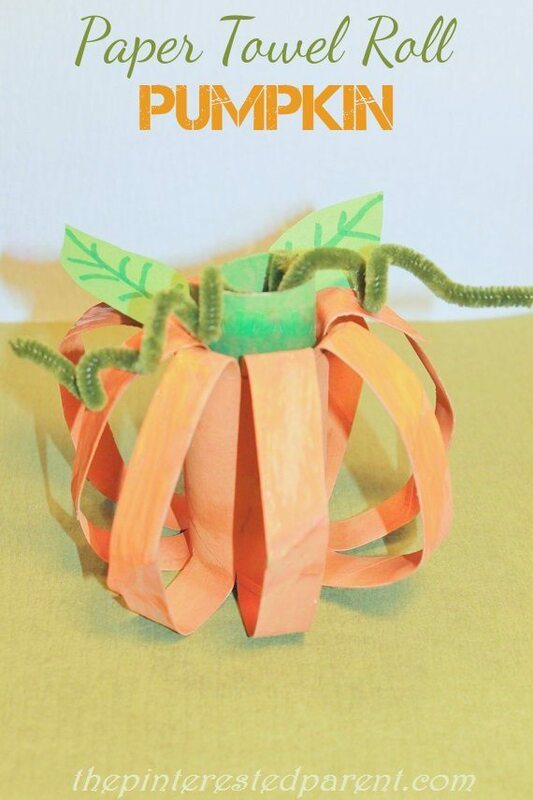 Stick them in the stem to finish off your pumpkin craft. But we were not done there. 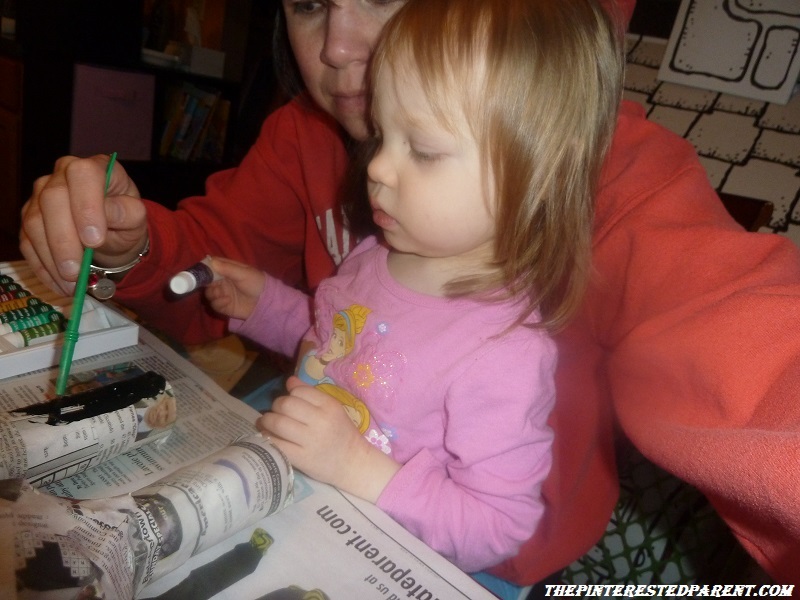 Mai chose to paint her tube black instead of orange. She wanted to cut her tube too. 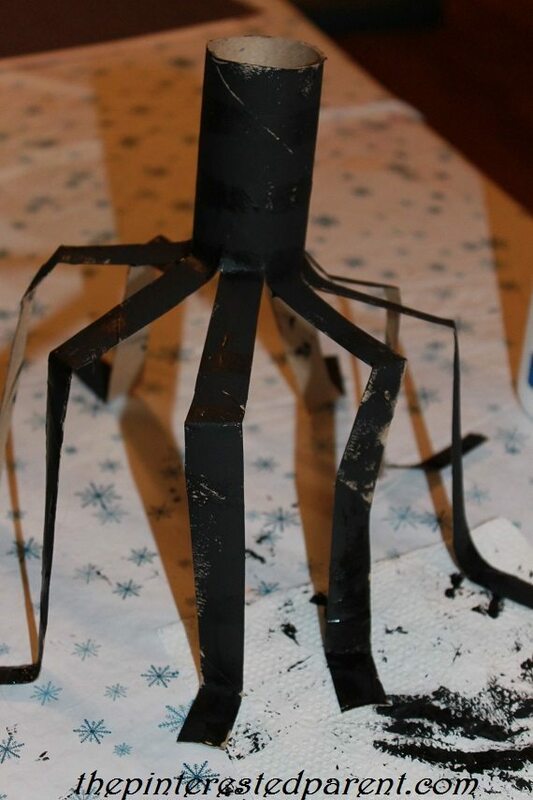 We chose to make a big spider out of the black tube. In fact we ended up making two because Mai wanted her spider to have a friend. 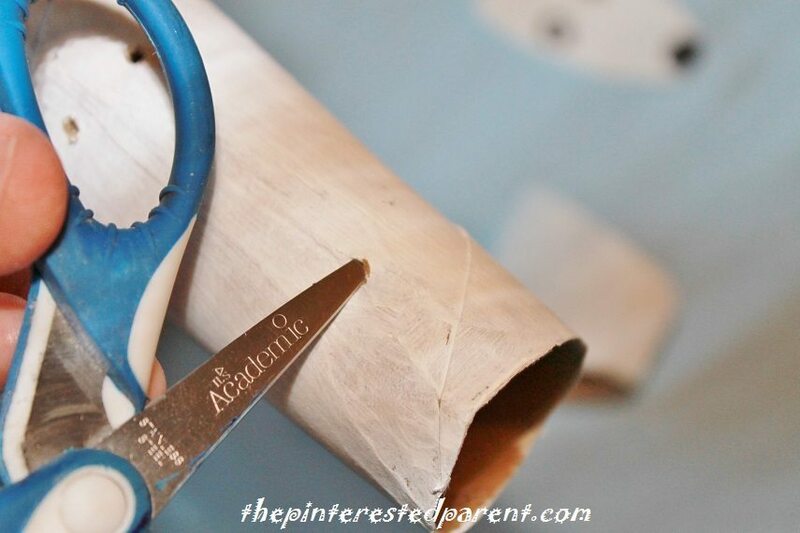 To make the spider, paint & cut the tube the same as above. Bend the strips out & then make bends for knees & feet. Push the uncut core down & bend the legs up around it. 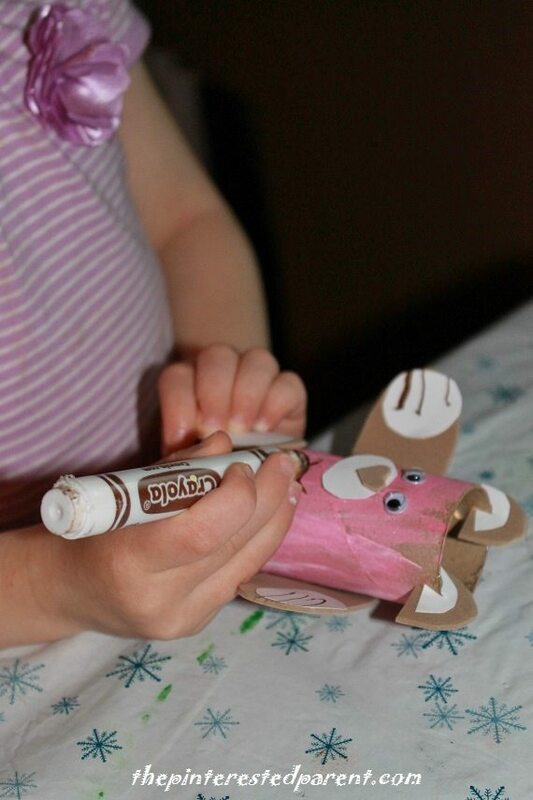 Add a little glue behind the knees to make the bends stay. 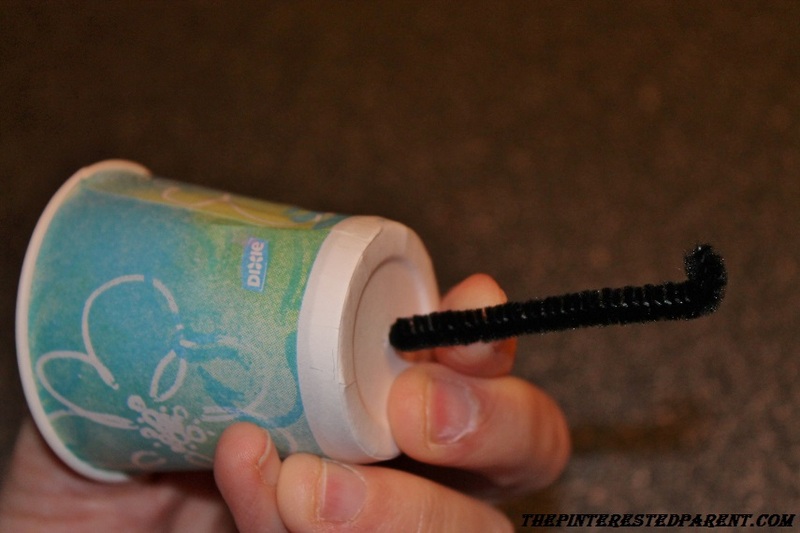 Add googly eyes & glue a pipe cleaner to the inside of the tube. 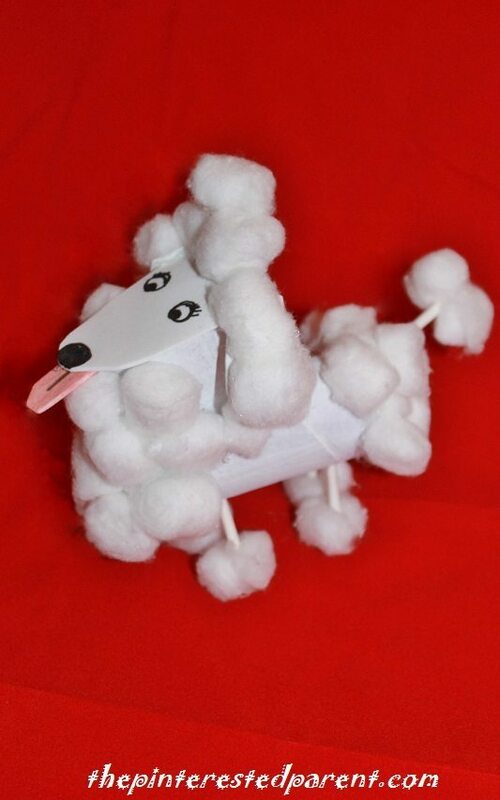 There is something about poodles. They are so grand and elegant. 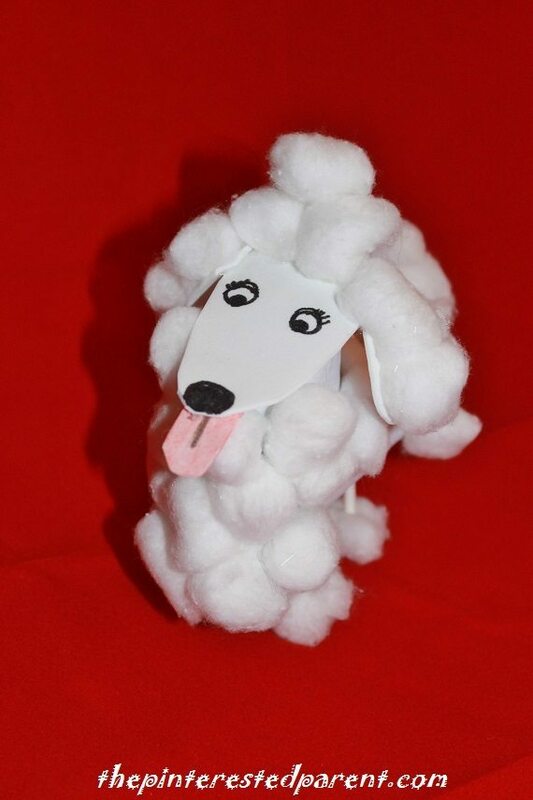 My daughter has a cute poodle purse that hangs on the door knob in her room. 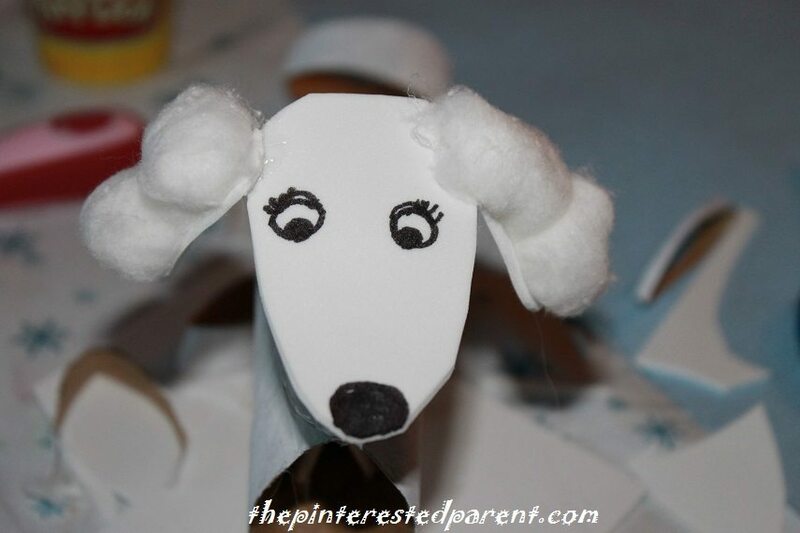 I was looking at it today while we were playing in her bedroom and I felt an overwhelming need to make a poodle. 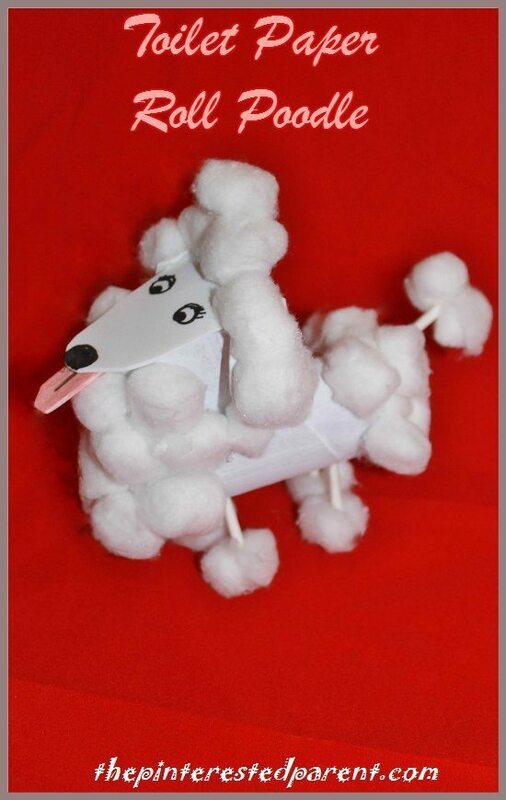 Paint two toilet paper tubes in white or any other color that you would want your poodle to be. 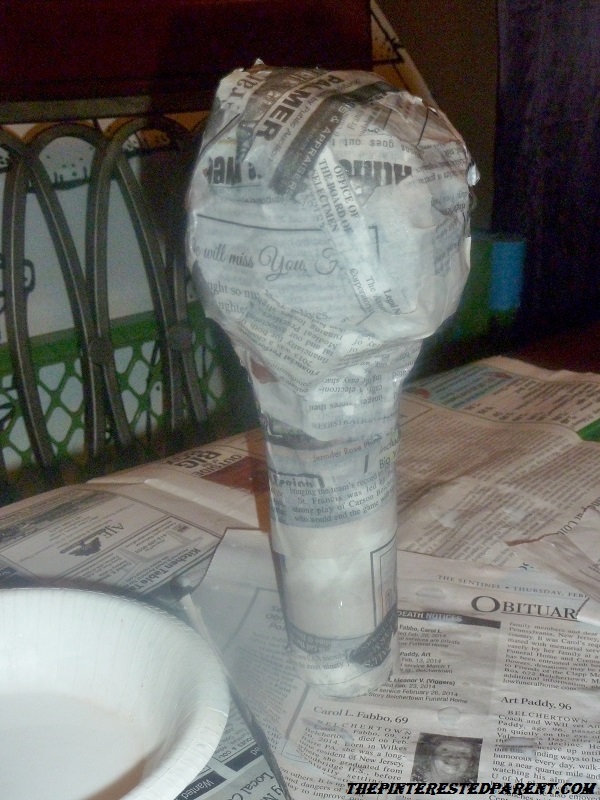 Cut one tube for the body & cut a smaller section for the neck. Cut them at a slant on one end. 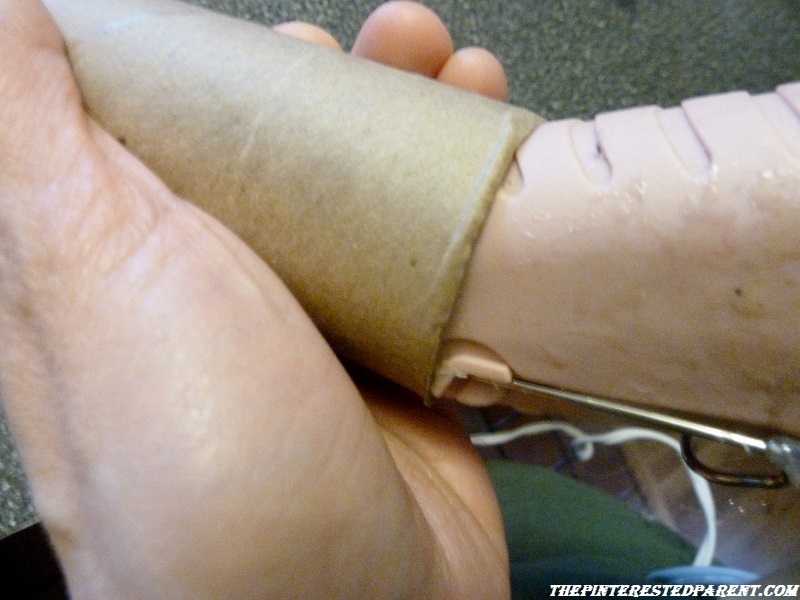 Poke 4 holes into the larger tube where you would like your legs to be. 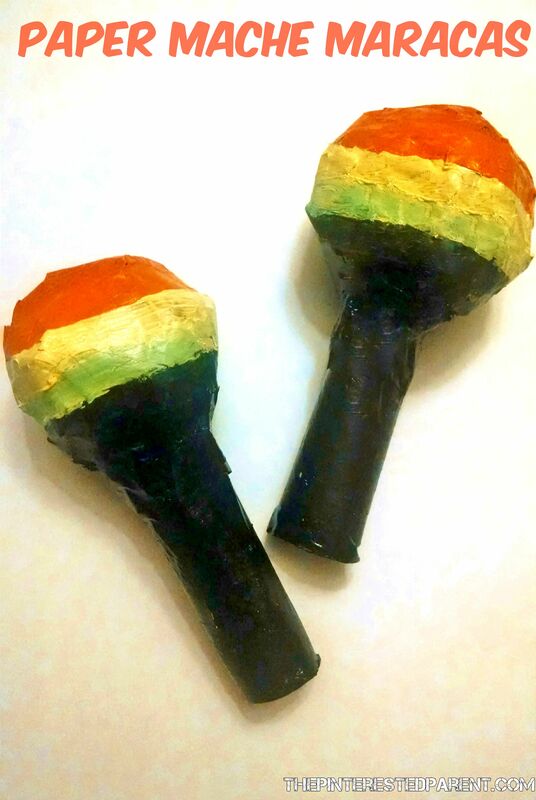 Cut 2 cake pop sticks in half & poke all 4 stick pieces into the holes. 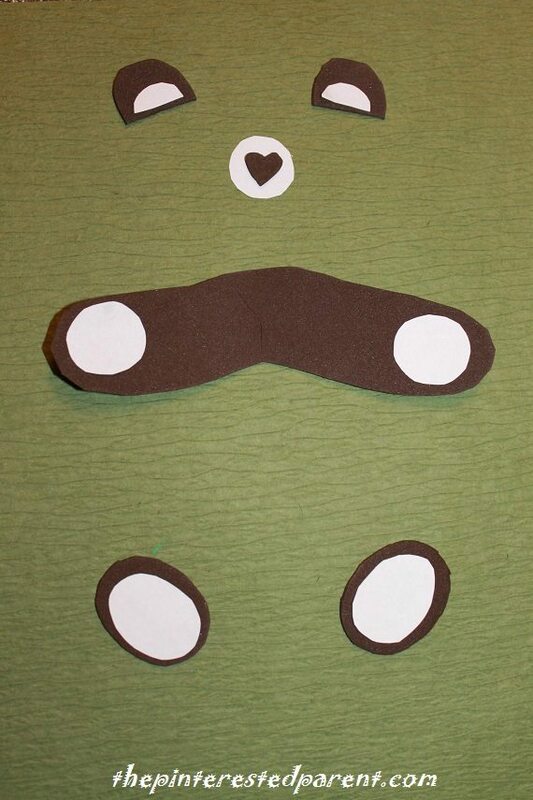 Cut a head out of construction paper & draw in the face. Glue the neck to the top of the body with the slant on top & facing away from the body. Glue the head over the neck hole opening. Glue cotton balls over the ear pieces & then glue the pieces to the side of the head. 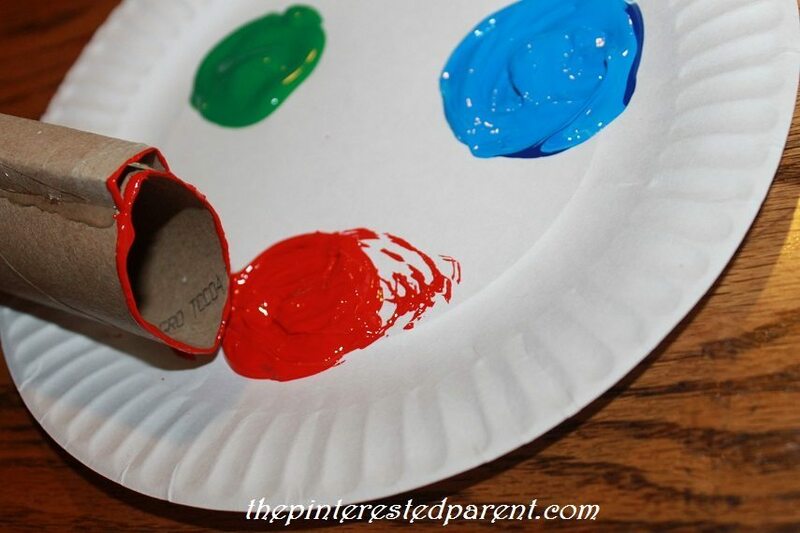 Fill the openings on either end of the body with cotton balls & glue more balls around the edge. Make sure to keep the center of the body bare. Add another half piece of cake pop stick to the rear. 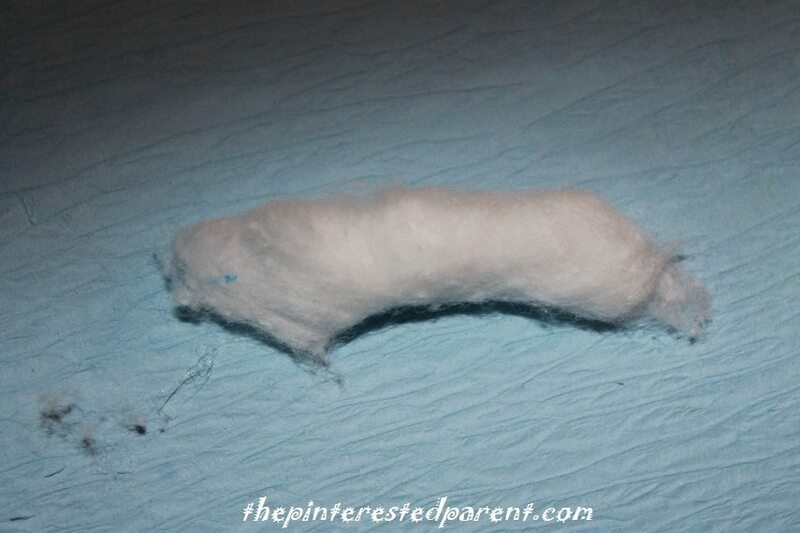 Glue a couple of cotton balls around the tip to form the tail. 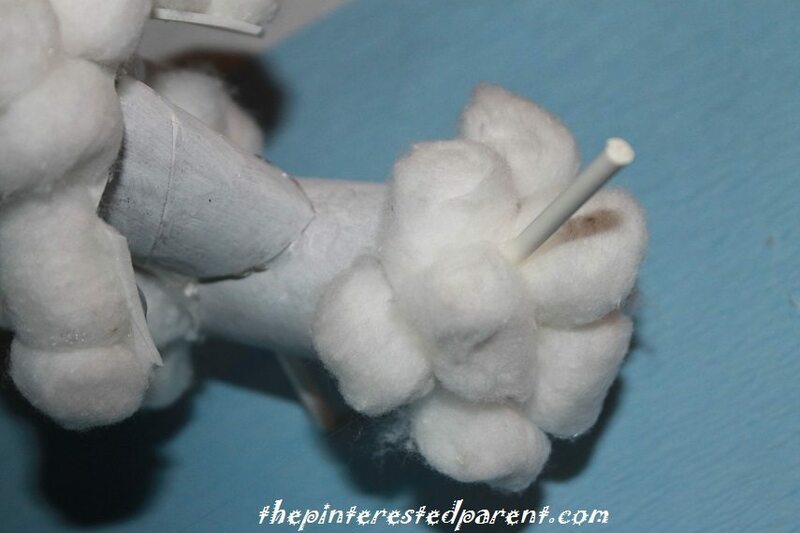 Stretch out a cotton ball as shown & glue around the bottom of a leg & repeat with the other 3 legs. 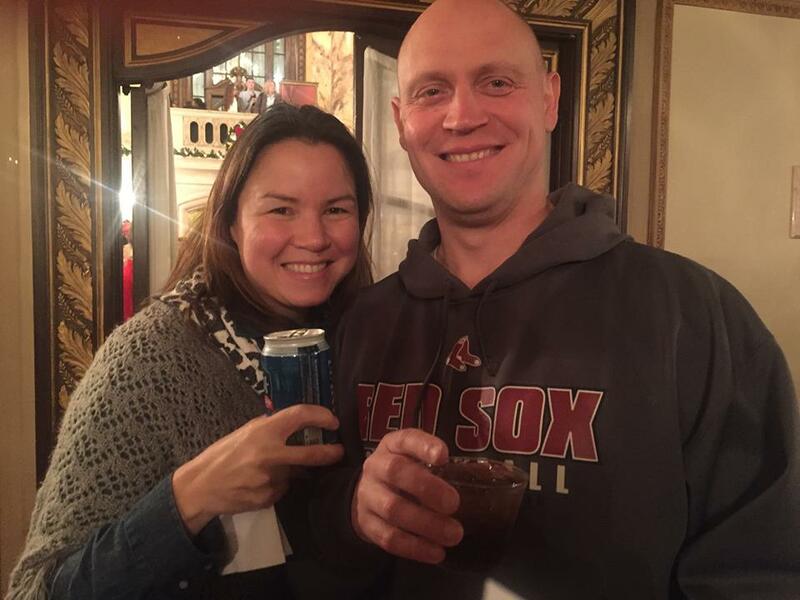 This weekend we went to a birthday party for one of Mai’s friends. She played outside with her friends & ate cupcakes and had a great time. It also got her talking to me about her next birthday party. 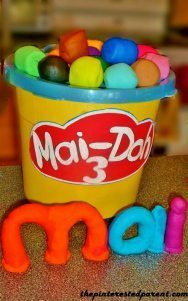 Last year we had a Play-Doh themed birthday party. This year she told me that she would like a Teddy Bear party. Since her birthday is 7 months away, I have a lot of time to think up some ideas & plan for it, providing she doesn’t change her mind from now until then. All weekend she talked to me about her teddy bear party. 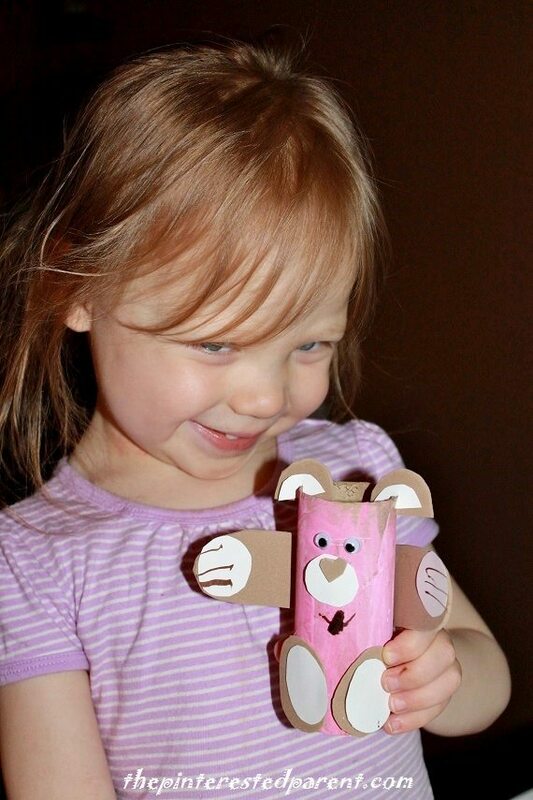 “I really like Teddy Bears, mama.” She was so wide-eyed and excited that we had to have a little bit of Teddy fun now. 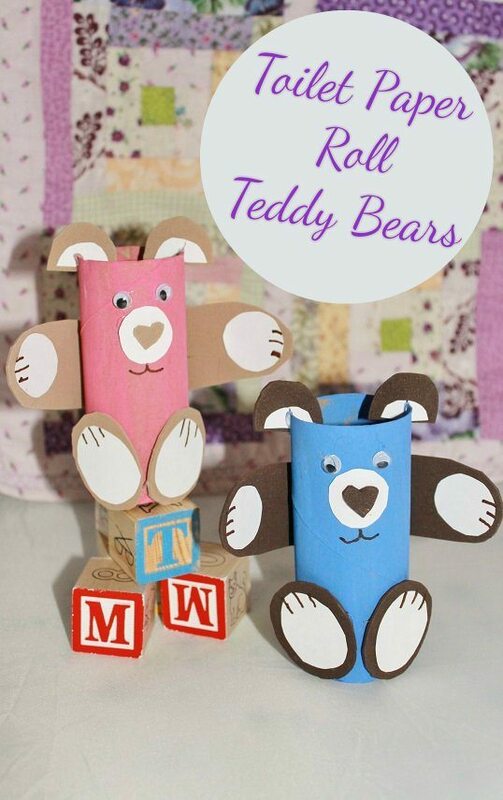 Paint the toilet paper rolls in your Teddy Bear colors & let them dry. My girly girl of course wanted pink. 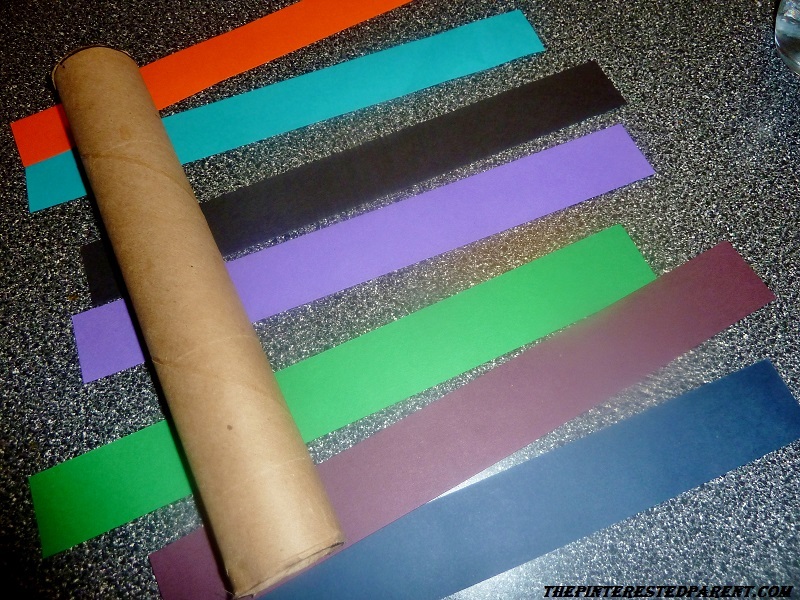 While the tubes dried, we cut shapes out of two different shades of construction paper for our bear parts. 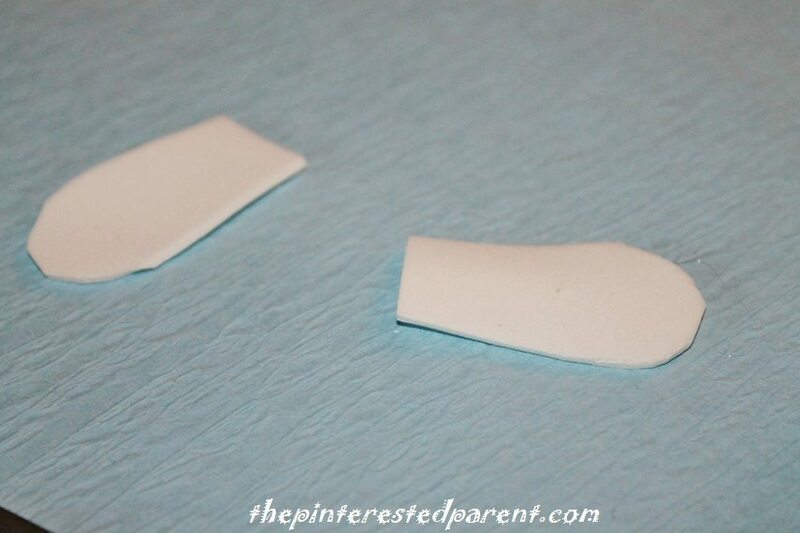 Using a glue stick we glued the white shapes into the brown as shown. 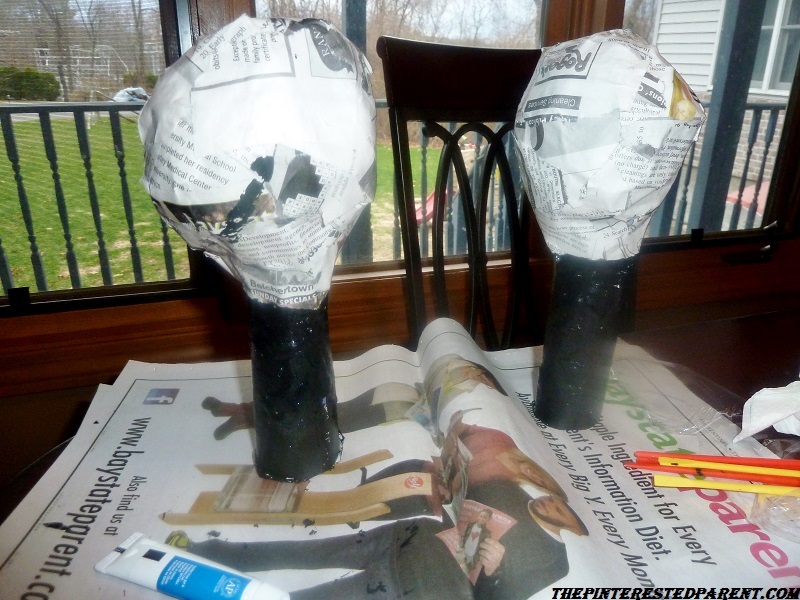 I glued the parts onto the tubes for Mai & I. We drew in the bear’s paws & mouth with magic marker. Mai was right, she really does love Teddy Bears. 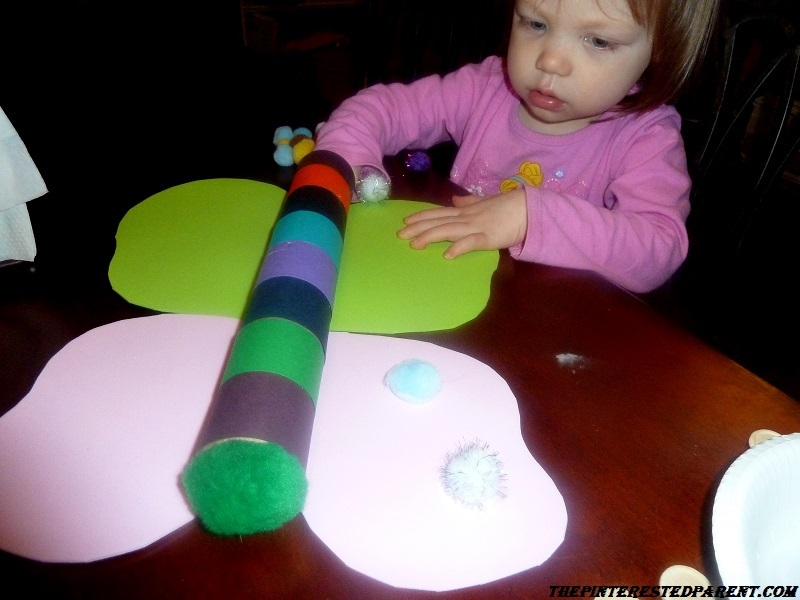 Last week Mai asked me if we could make a craft with sunshine, rainbows & clouds. 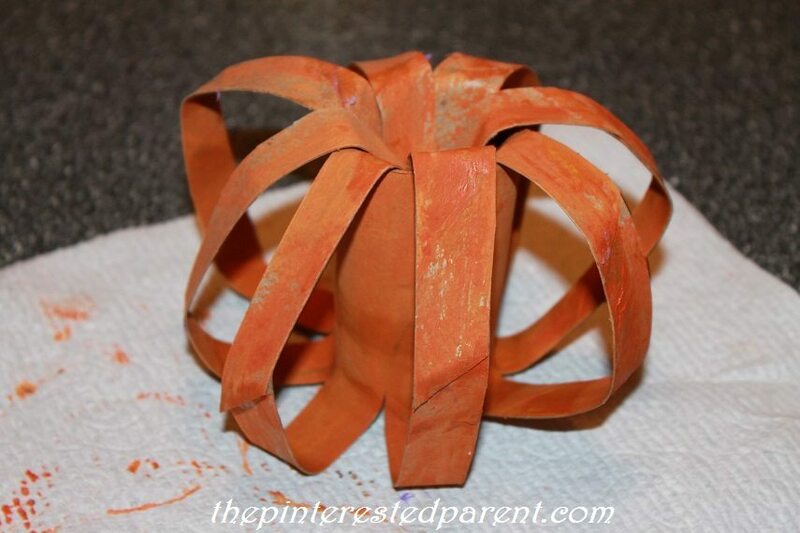 We made a couple of cute paper plate crafts together with all of these things, but when we were finished, she looked at me and said “Mama, you forgot the spider & the spout.” I apologized for being a silly mama & told her that we could make our spider craft another day. 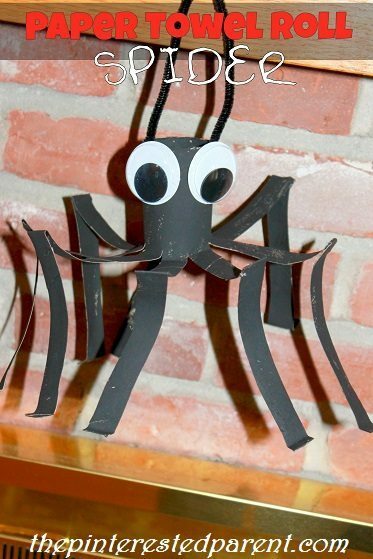 My daughter does not forget a thing, so of course she did not forget that I promised her an Itsy Bitsy Spider craft. 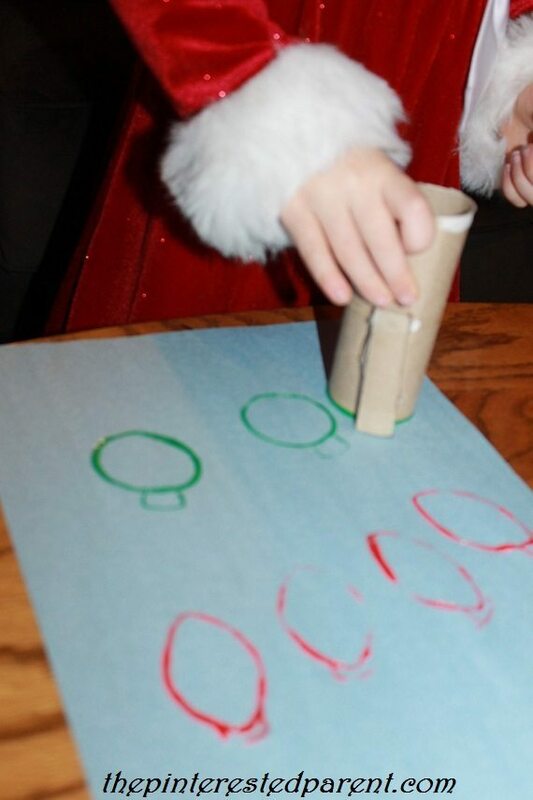 Optional: construction paper, cotton balls, buttons, markers, crayons or other embellishments to make your background. 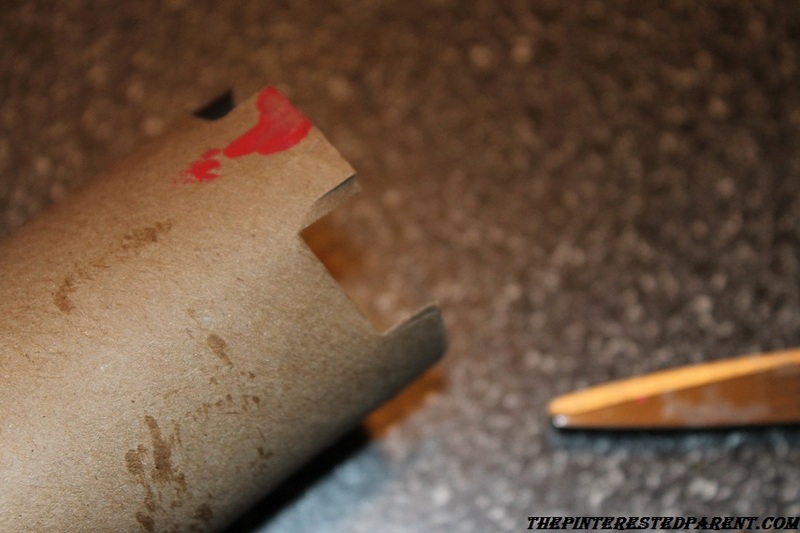 Cut your paper rolls open lengthwise. Paint them white & let dry. Craft a spider using pom poms & pipe cleaners. I let Mai glue hers together, but then used a glue gun to make it more secure. 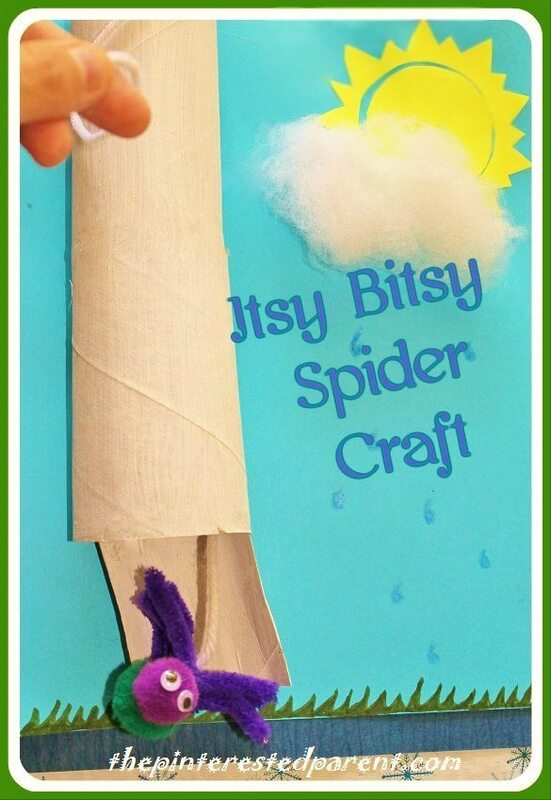 Glue a long piece of yarn to the end of your spider. The piece should be long enough to feed through the whole spout. 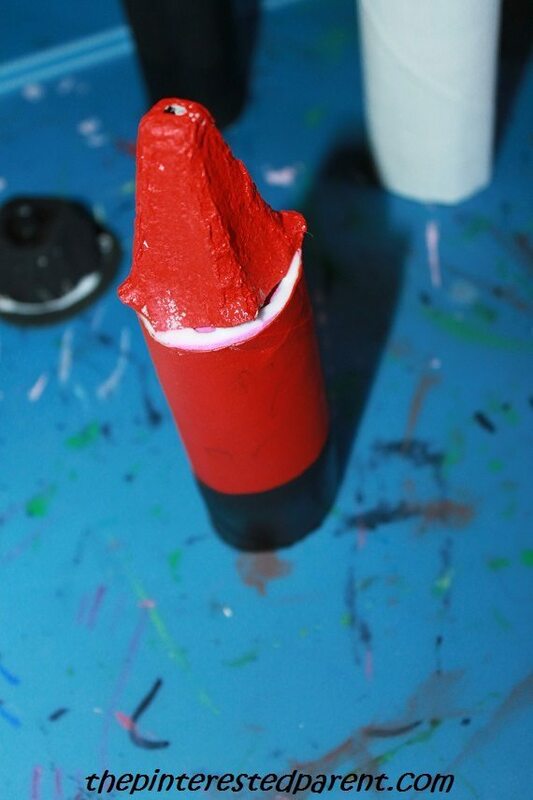 Glue the painted tubes to a piece of cardstock, cut side down. Open the tubes slighty to widen your spout. 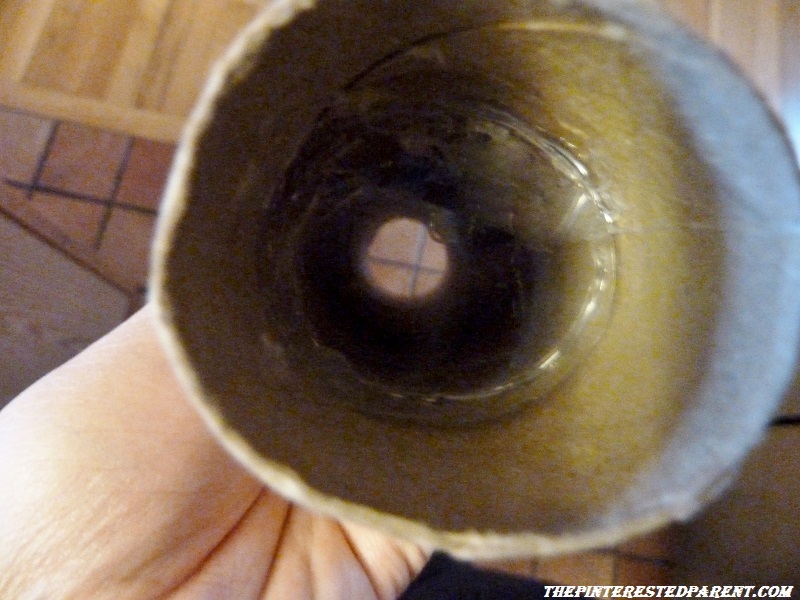 Cut a small section of tube in half lengthwise & glue it so that it comes out of your gutter. 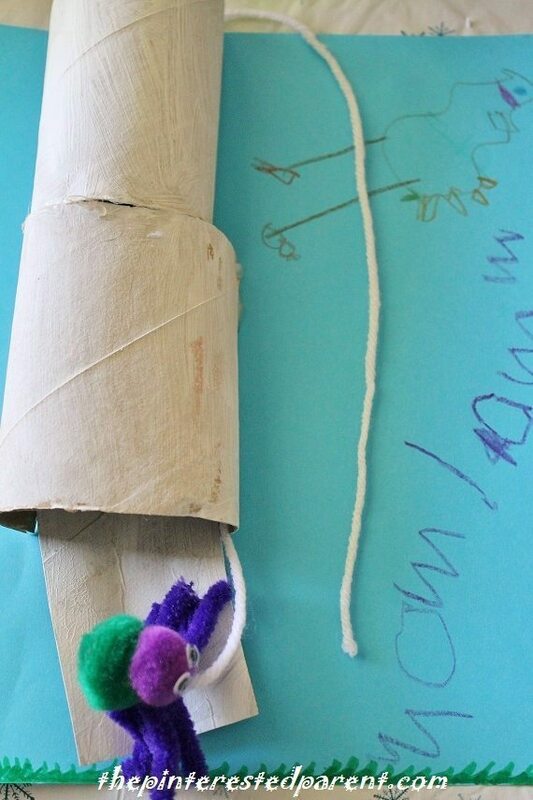 Run your piece of yarn up the pipe so that the spider dangles below the spout. 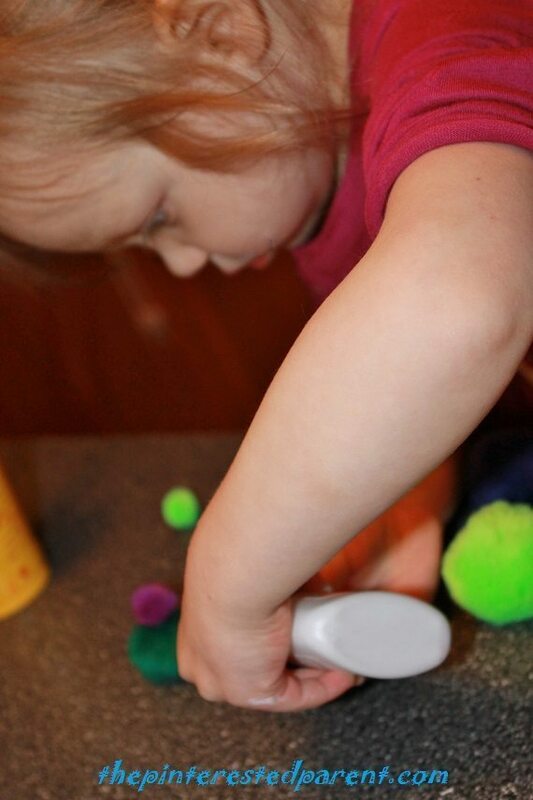 Let your toddler pull the spider up & back down. 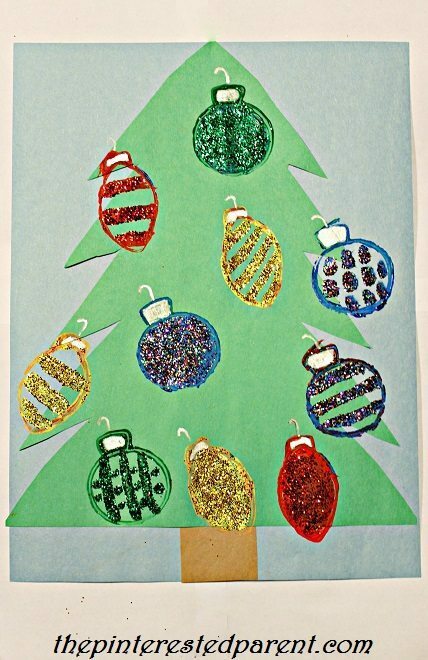 Add embellishments for a background to create a scene. Mai drew in a big bird & even dedicated her craft to me. Awww. Before we had our daughter we kept a pretty neat home. We had little knick knacks on our coffee table, there weren’t scuffs & marker on our hardwood floor & I used to have a clean & bare refrigerator. I hated having things on my refrigerator. I thought it looked ugly to have shopping lists & magnets hanging off of it. Fast forward to today & things are a bit different. My kitchen is now an art studio. 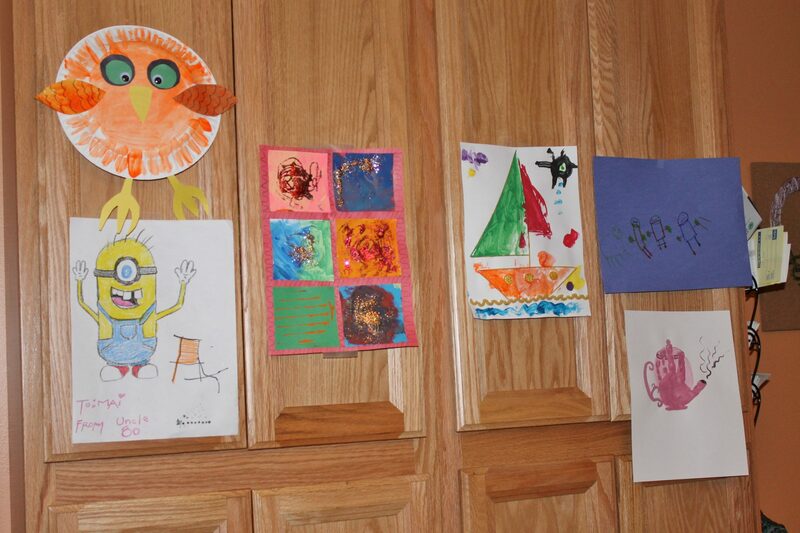 Our kitchen cabinets, our refrigerator & our kitchen windows are covered with all of my daughter’s arts & crafts. This would have made the old me cringe, but now it just makes me smile. 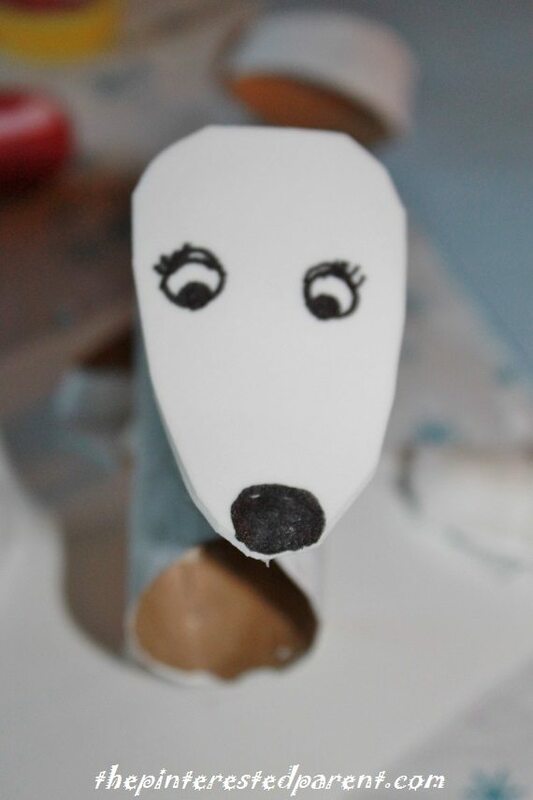 Since these days our art projects have become part of the decor, I thought at least we could make a craft that matches with our kitchen’s theme. 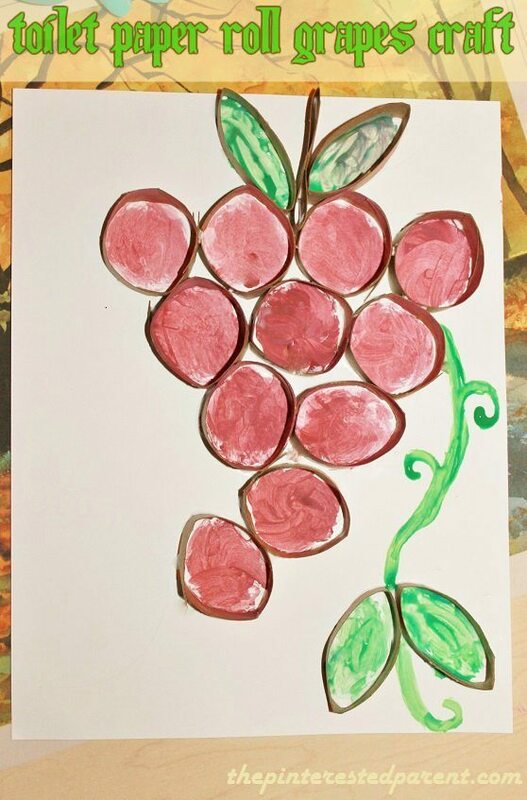 It is Tuscan themed with grapes & vines, so we made a grape craft. 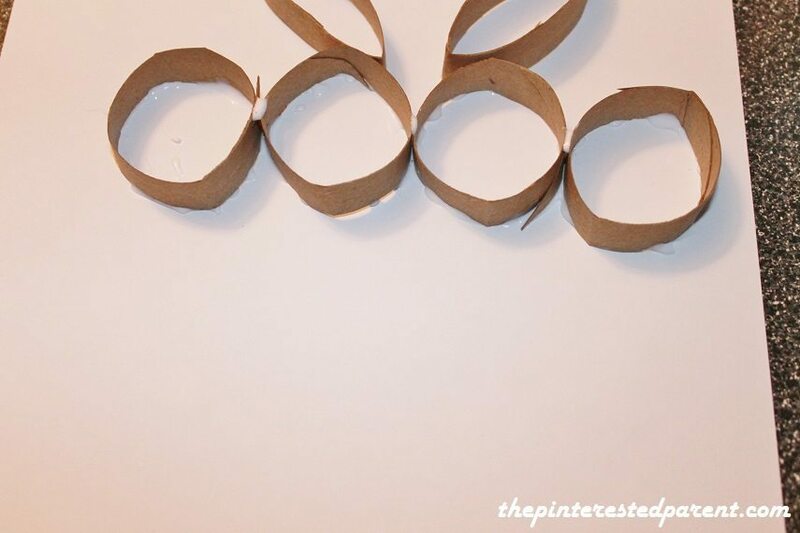 Gather a few rolls & snip into 1/4″ rings. 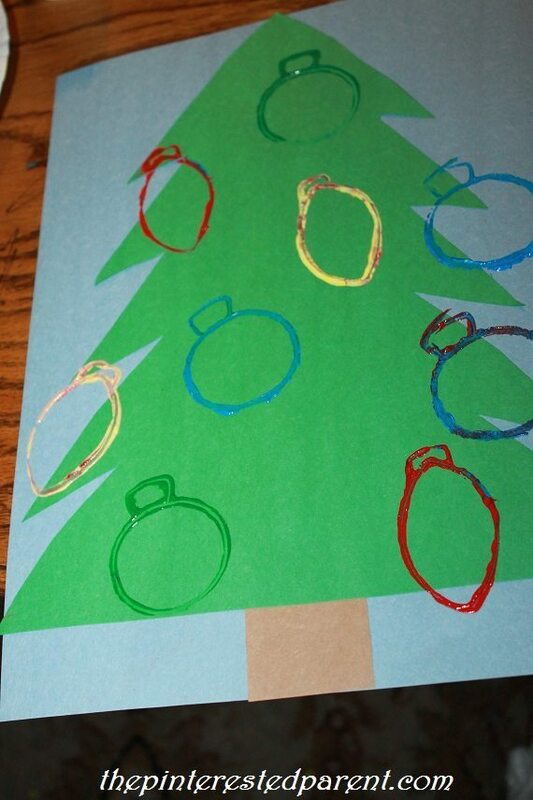 Shape & arrange the rings as you go, to make sure that you have enough cut & map out your project. 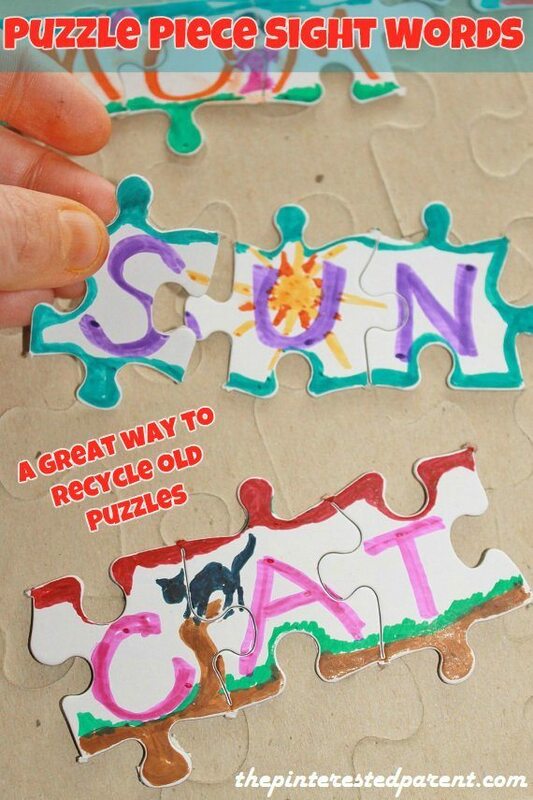 Glue each piece into place. 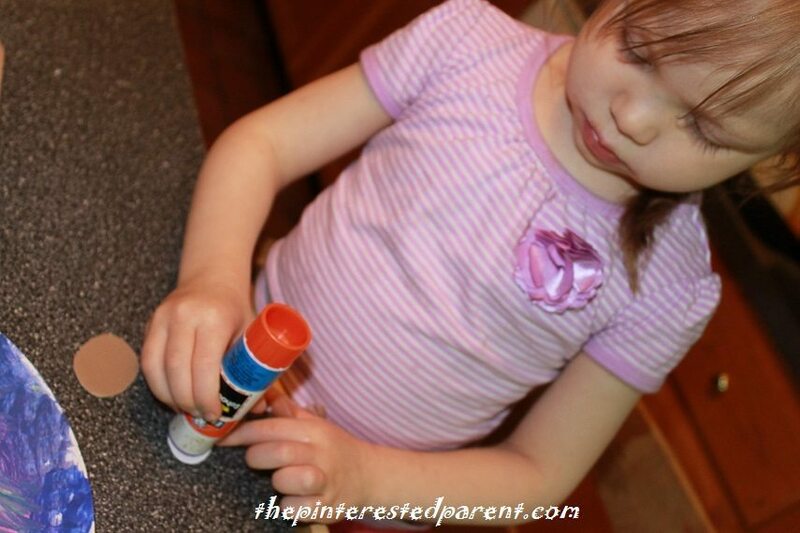 Mai helped apply the glue & I put them in place. Let the rings dry. 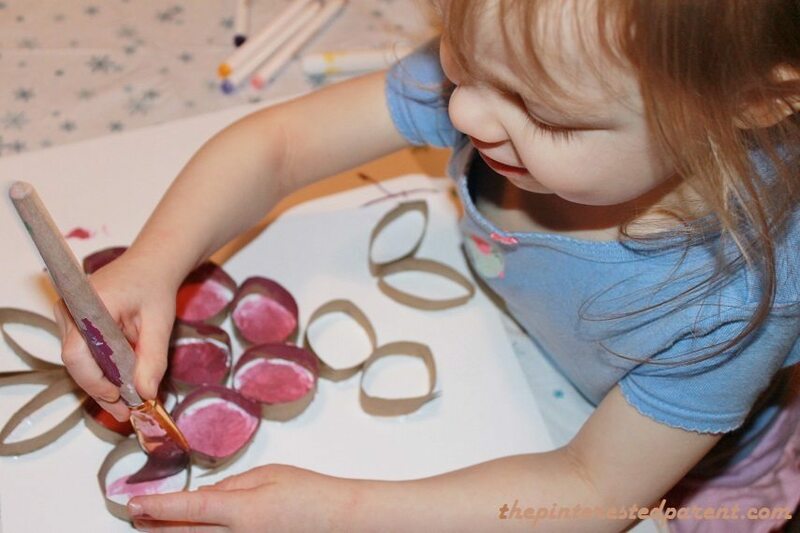 Let them paint within the glued shapes to make a pretty picture perfect craft & then let dry. This will make a great addition to our artastic kitchen. It has been building for a while. I knew it was coming. It was inevitable. After almost 3 years of living under the same roof with Elsa, Cinderella, Rapunzel & my personal favorite Merida, my daughter has become a princess. She tells me all the time. “Mama, I a princess.” Tutu skirts must be worn every day. She even puts them on over her sweats when she goes to gymnastics. She loves Elsa just like all little girls these days, but still her favorite princess is Rapunzel. 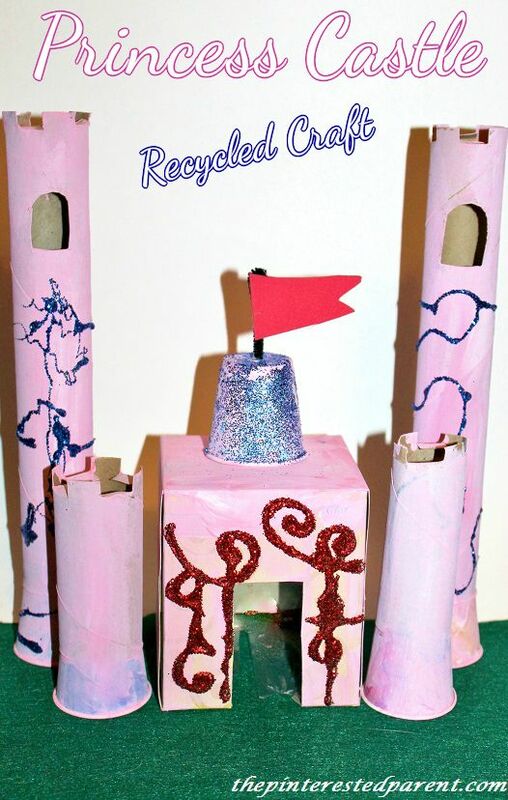 Rapunzel towers are built out of Legos, blocks, Play-Doh containers & just about anything else that is stackable. 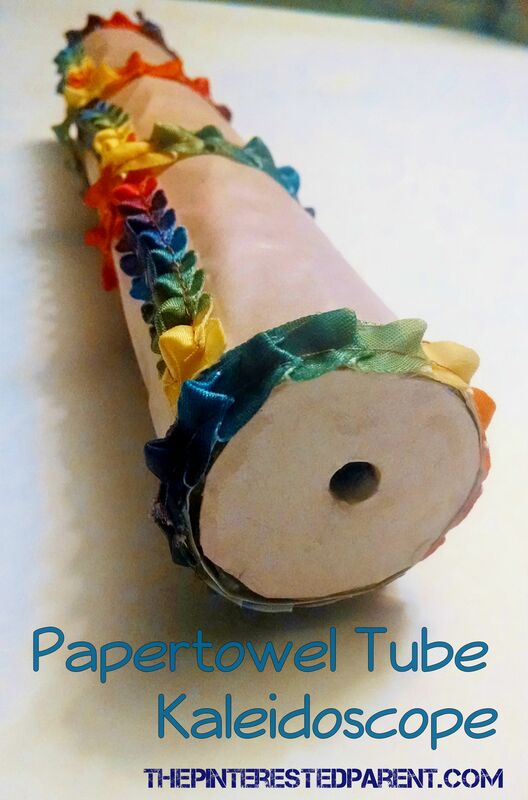 I have a collection of paper towel tubes saved up for crafting. Mai will get into them sometimes. She likes to use them as robot arms. 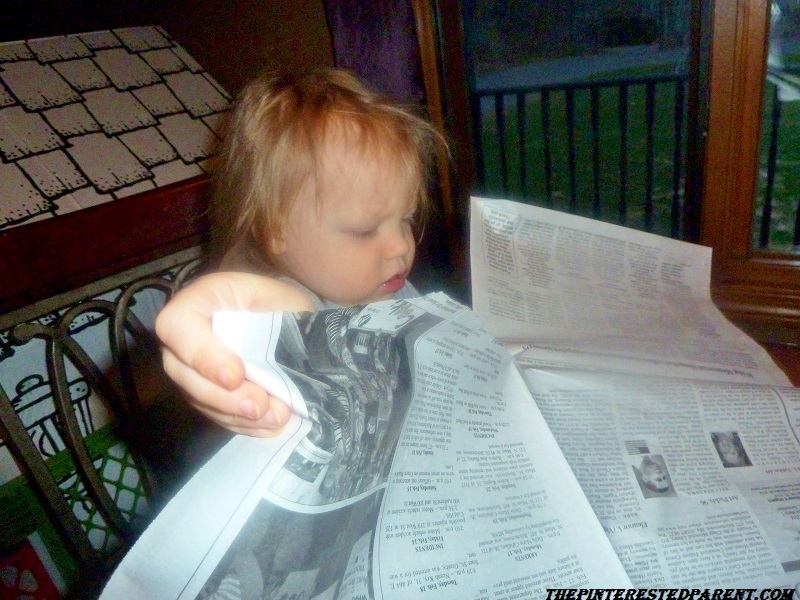 Today, she grabbed them. She stuck one in a Dixie cup & said “Look mama, I made Punzel’s tower.” That sounds like a great idea. 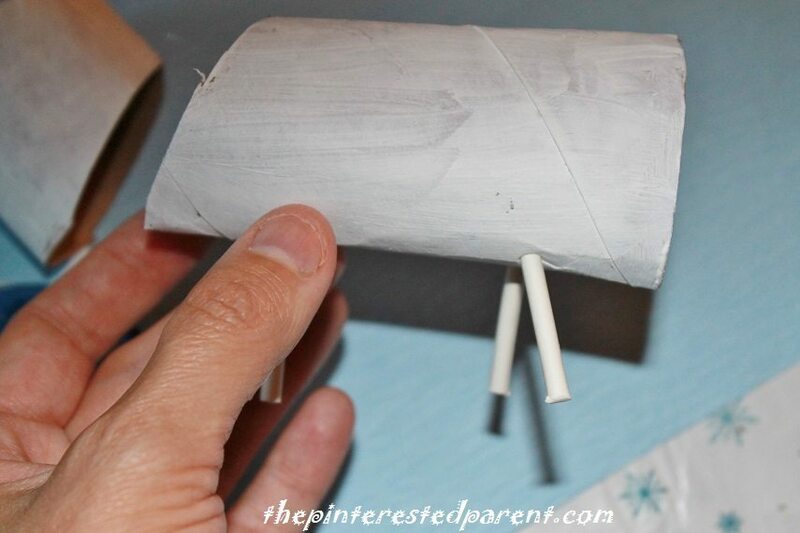 Cut out castle tops around the top of paper towel rolls & cut out windows. 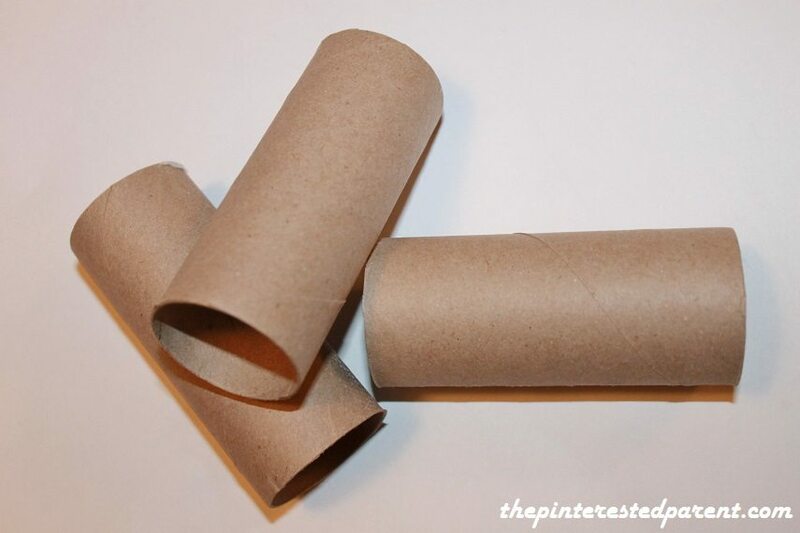 Cut rolls into different lengths to add different sized towers. 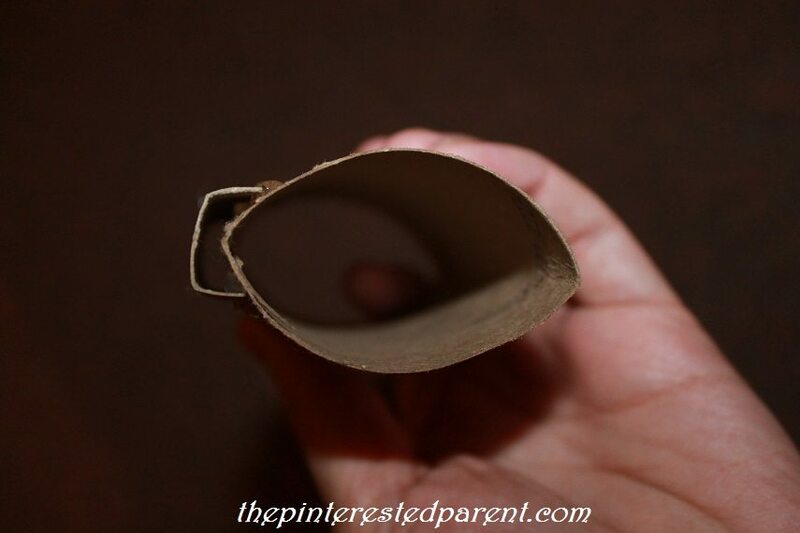 Stick the bottom end of a Dixie cup into the bottom of the uncut end of your tube. This will give it balance. Paint your towers in whatever colors you choose. For Mai, it had to be pink. 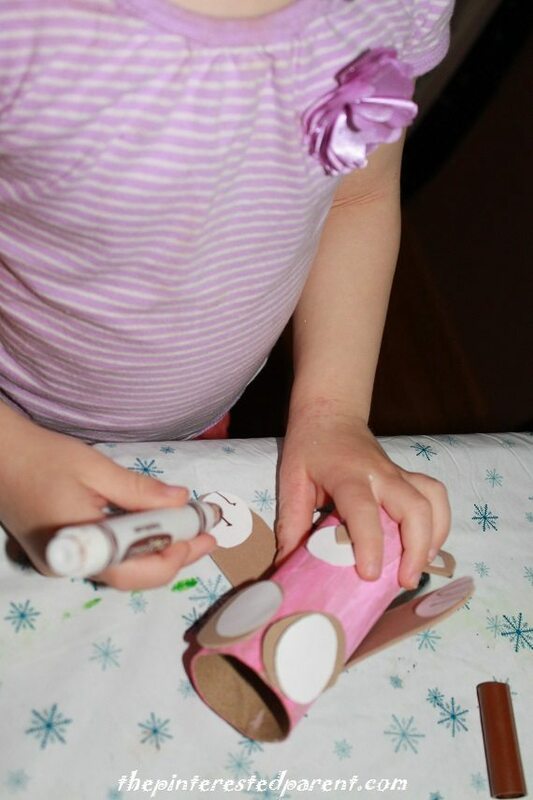 She is getting really good at painting every inch of her projects. 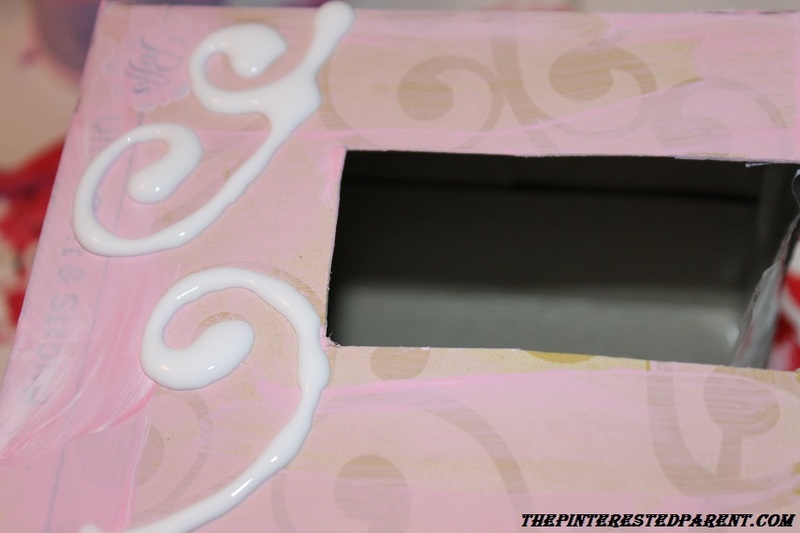 Cut out a door on your tissue box & also paint. 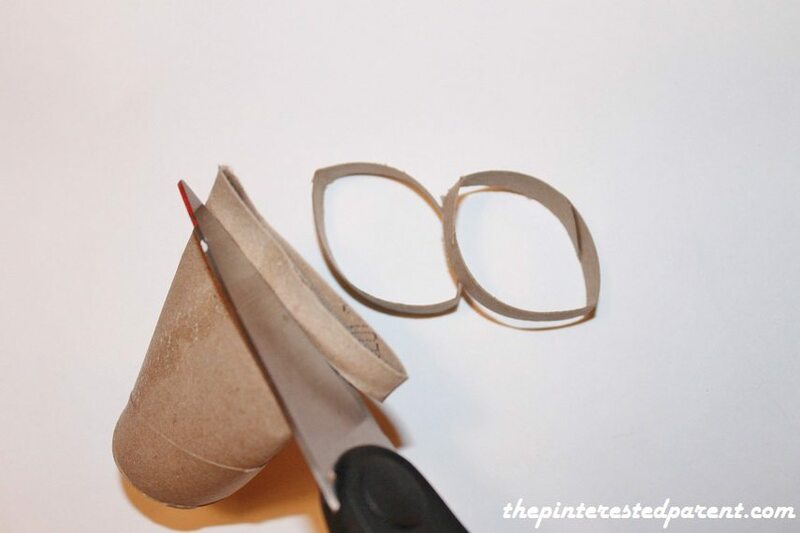 Stick a pipe cleaner into one Dixie cup. 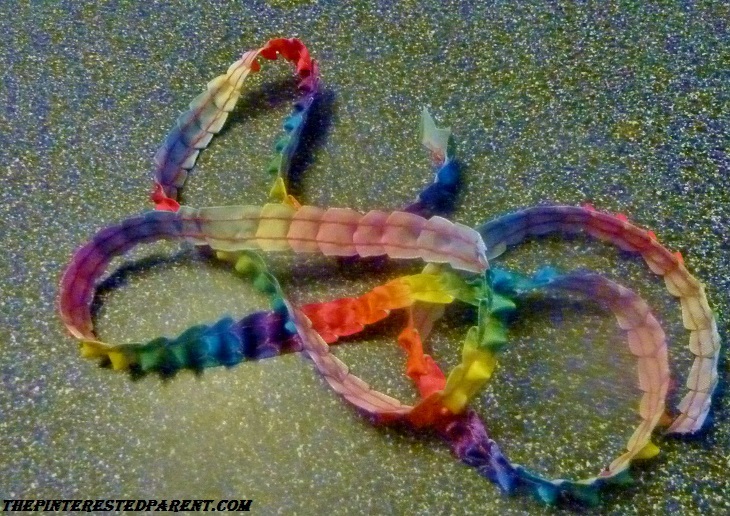 You will use this pipe cleaner to attach a construction paper flag to later. Paint the cup. 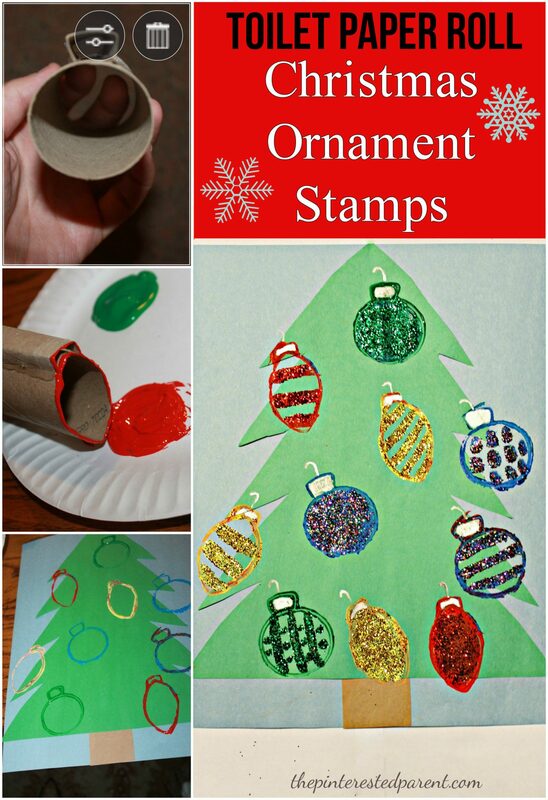 Add designs in glue & then sprinkle with glitter. 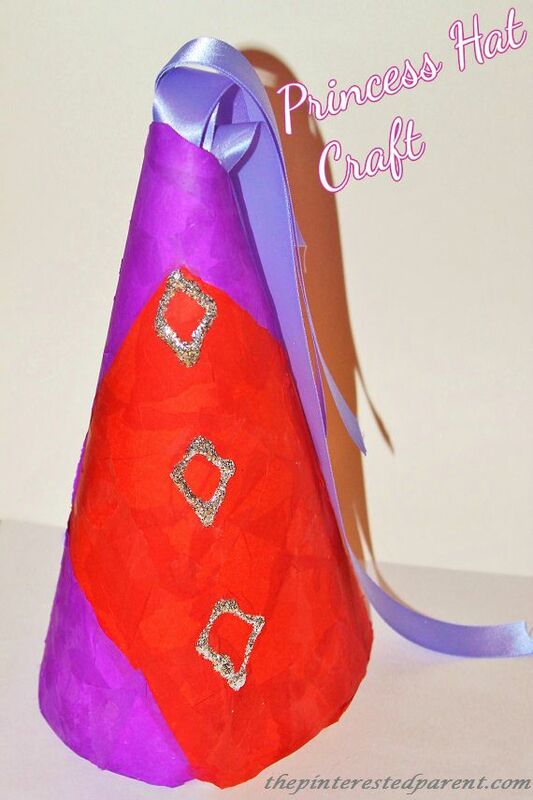 Add gemstones or other embellishments of your choosing. 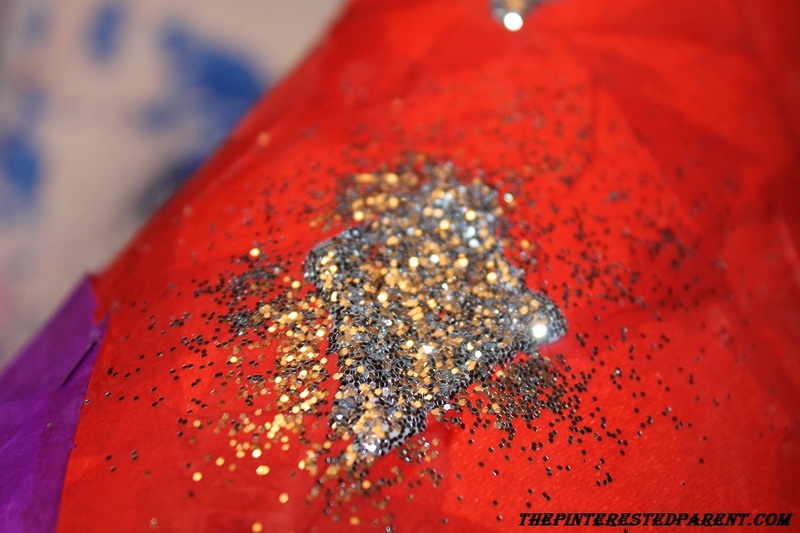 Let dry & shake off excess glitter. You can make your castle as small or large as you like. Get creative & have fun. Our princess has her castle, now she needs to look the part. 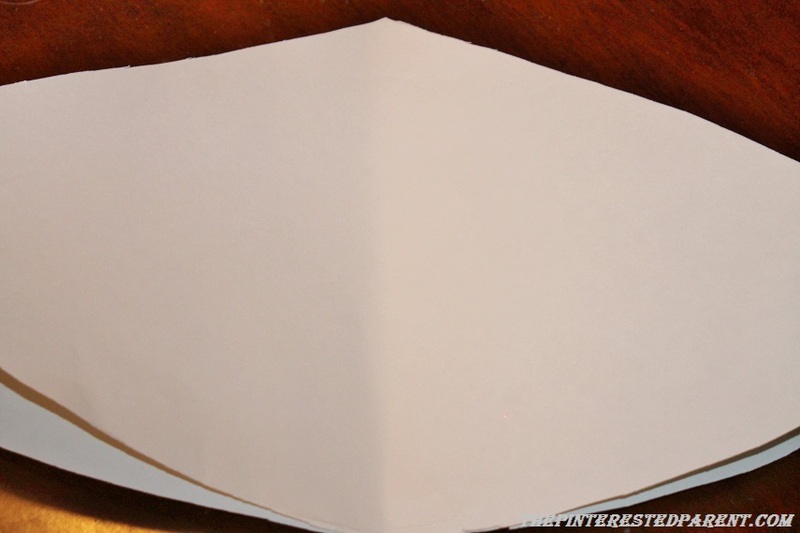 Directions: Cut out two pieces in a fan shape. Size will depend on the size of your child’s head & how high you want your hat. The pointed side will be the top. Overlap the two pieces facing each other until they form a cone. 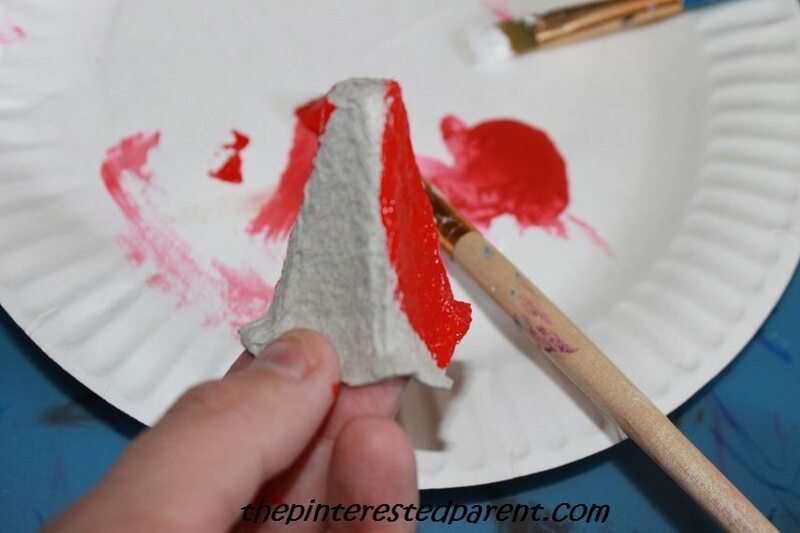 Leave a small opening at the top of your cone. 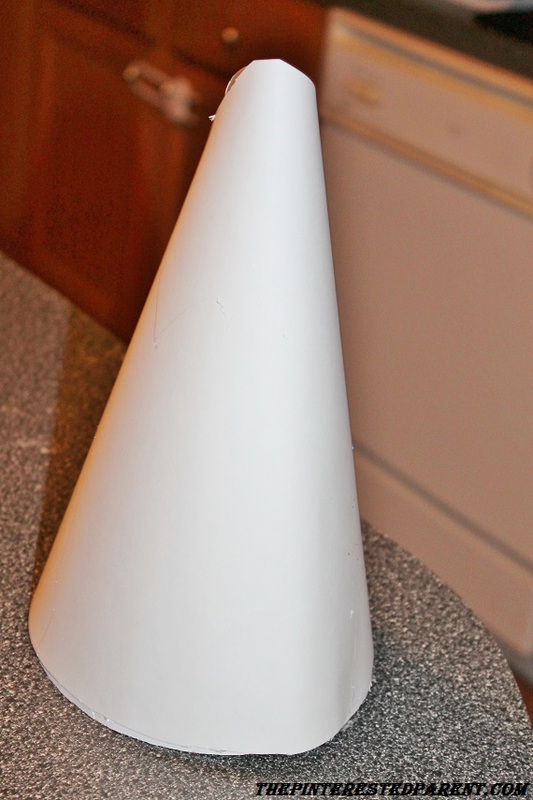 If you have something conical, use it as a template to wrap around. 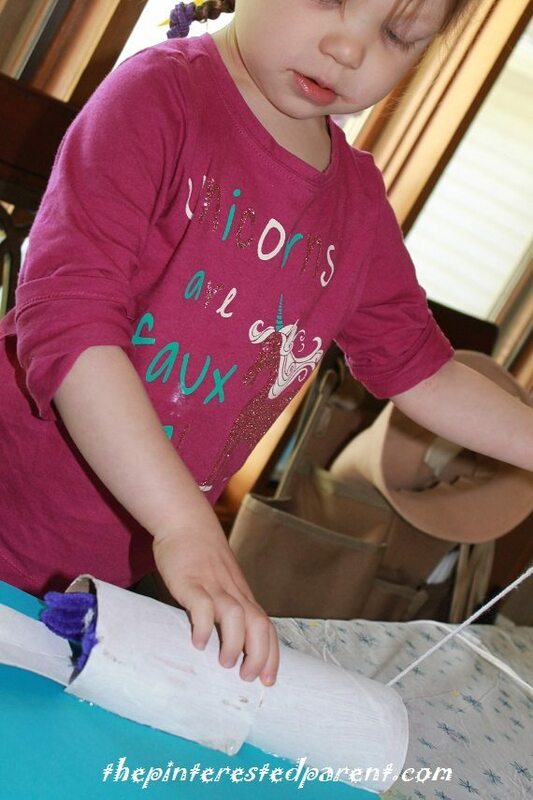 Tape, glue or staple your hat into place once you have it positioned the way that you want it. 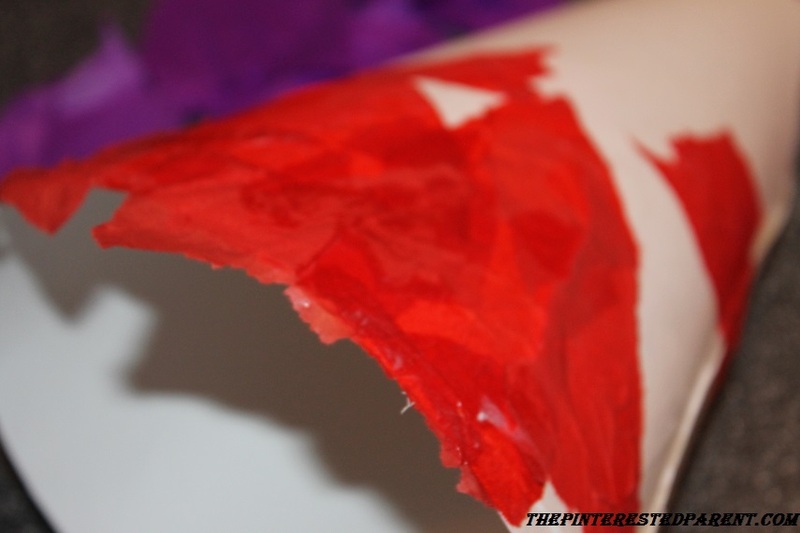 Rip up colored tissue paper. 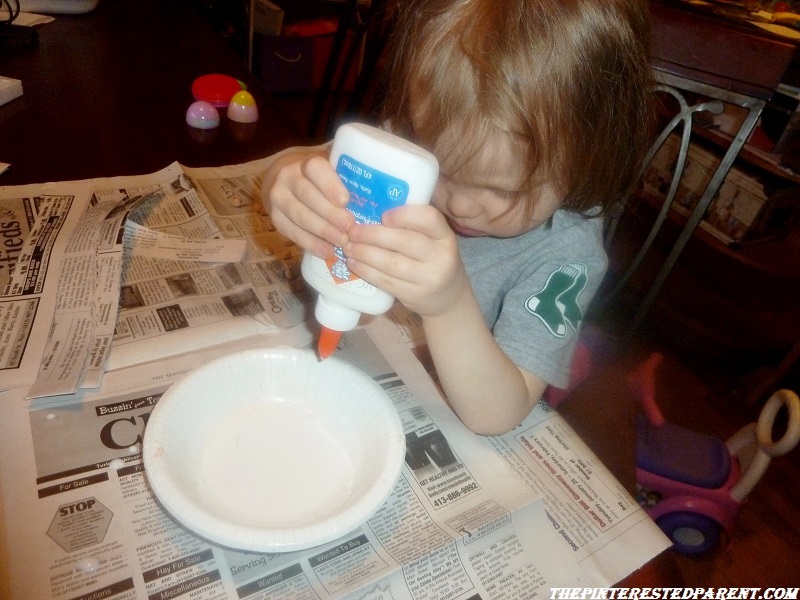 Mix up school glue with a few drops of water. 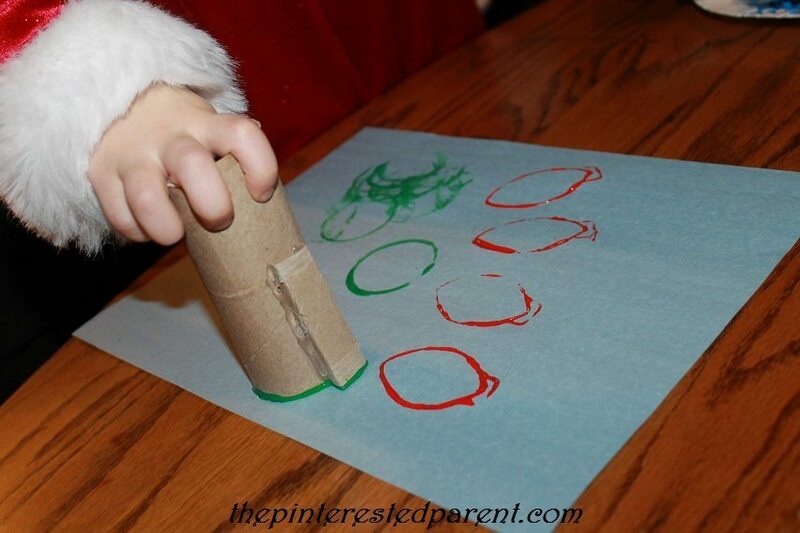 With a paintbrush paint on glue in patches & place & overlap the tissue papers. 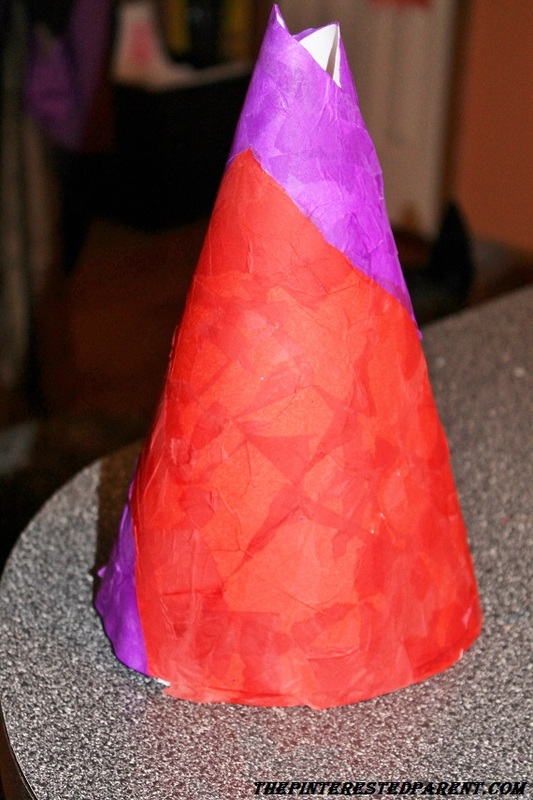 Overlap with tissue all the way around until the entire hat is covered. Let dry. 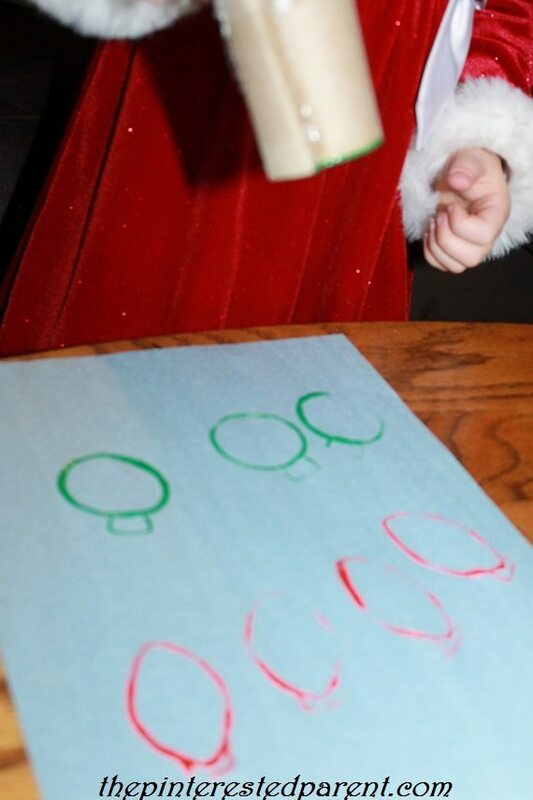 Draw designs with glue & then shake on glitter. 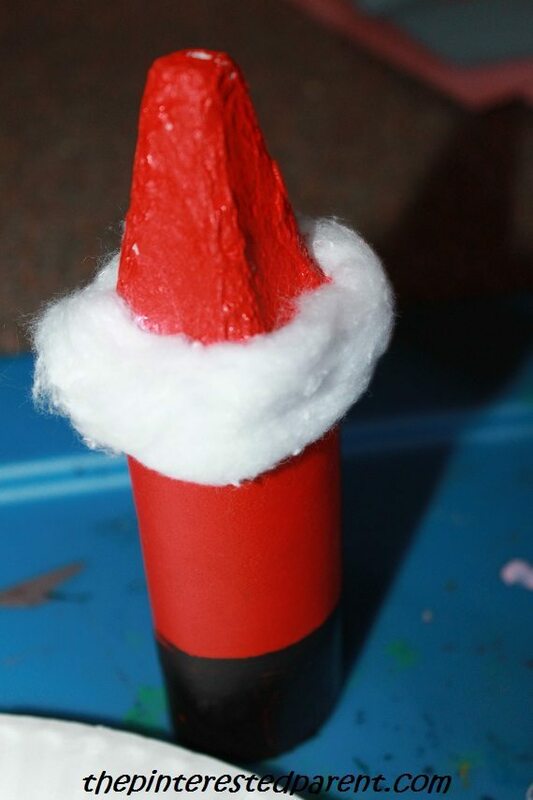 When glue dries, shake off the excess glitter. 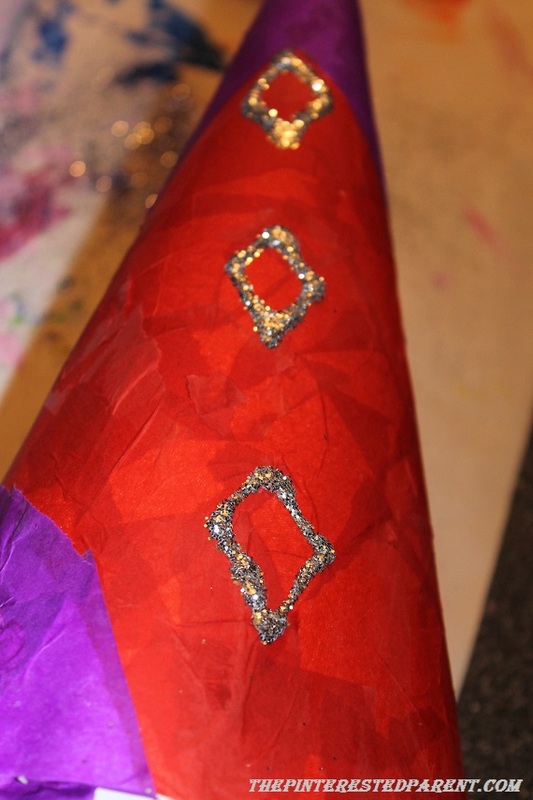 Add ribbon pieces to the opening at the top of the hat. Glue, tape or staple your hat into place. 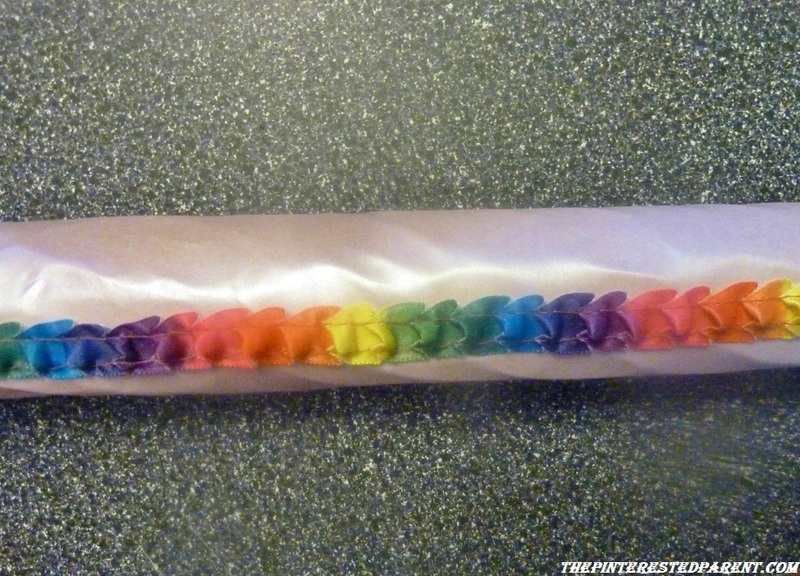 We used a hot glue gun for our ribbon. 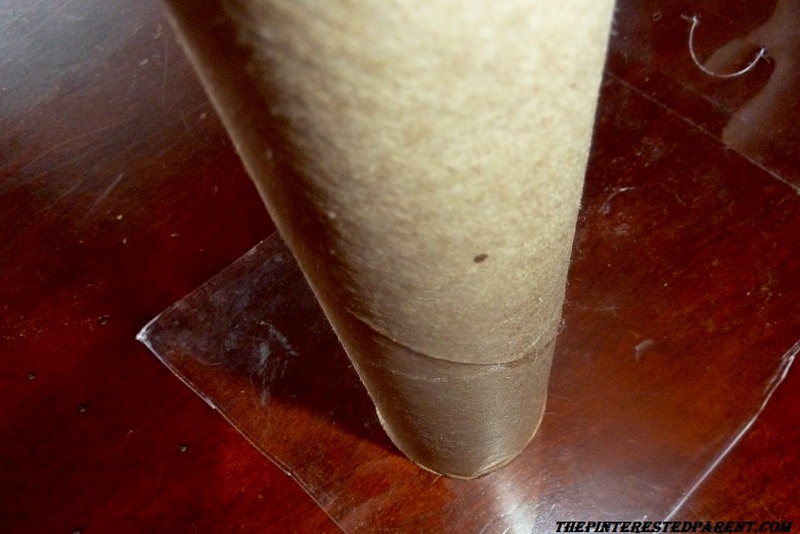 For the past few months now I have been hoarding away empty paper towel rolls. I had built up quite the collection and the sight of the rolls piled up on top of my kitchen cabinet was starting to give me hives. It was finally time to put them to some use. Mai and I have been on a craft frenzy this week. 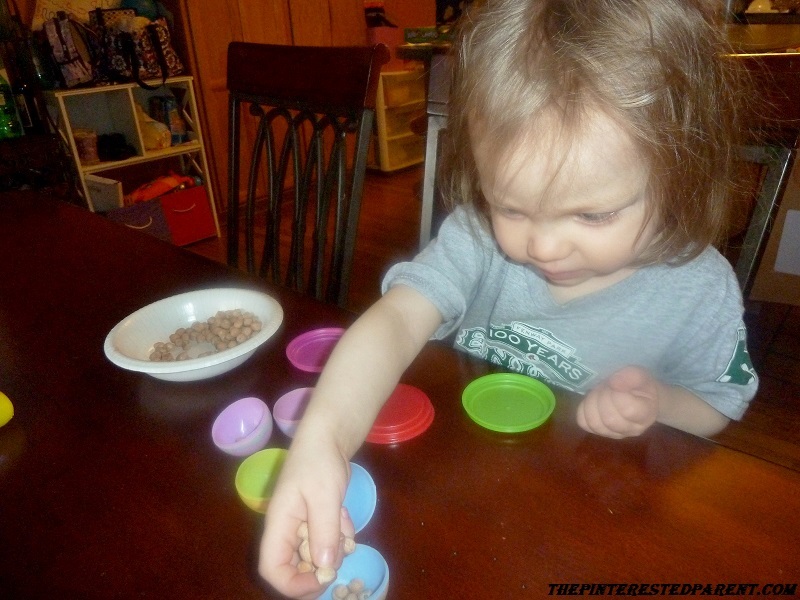 We made a mess, had a few tantrums & a few laughs and smiles too. 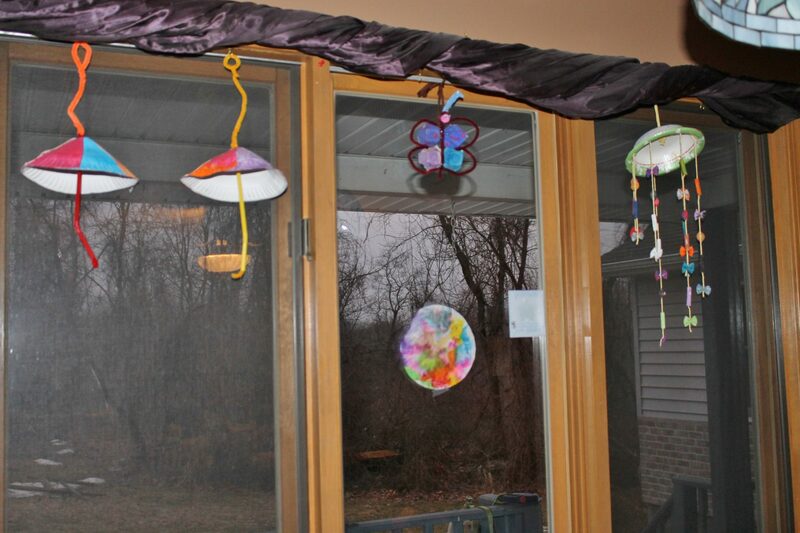 Each of these crafts that we made uses one of our paper towel tube. 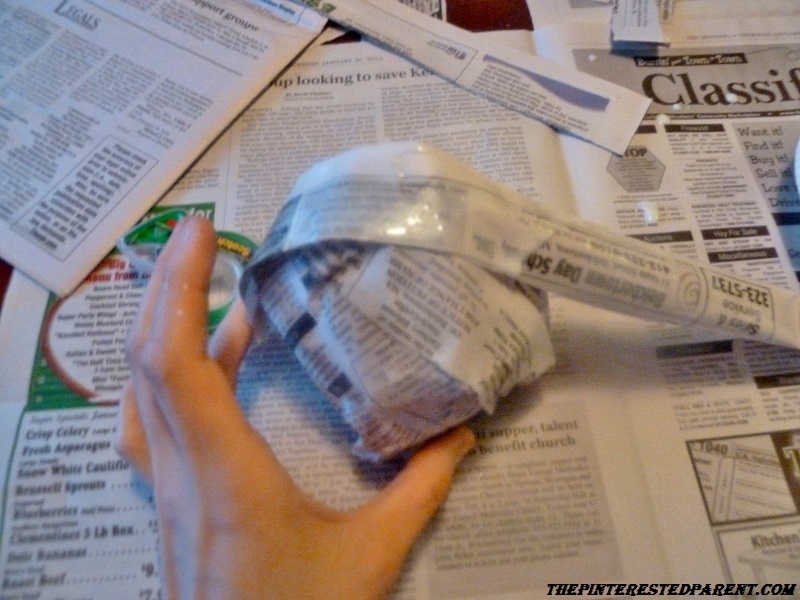 Use one or two full pages of newspaper & wrap in around the chickpea filled Easter egg. Form it into a ball shape. 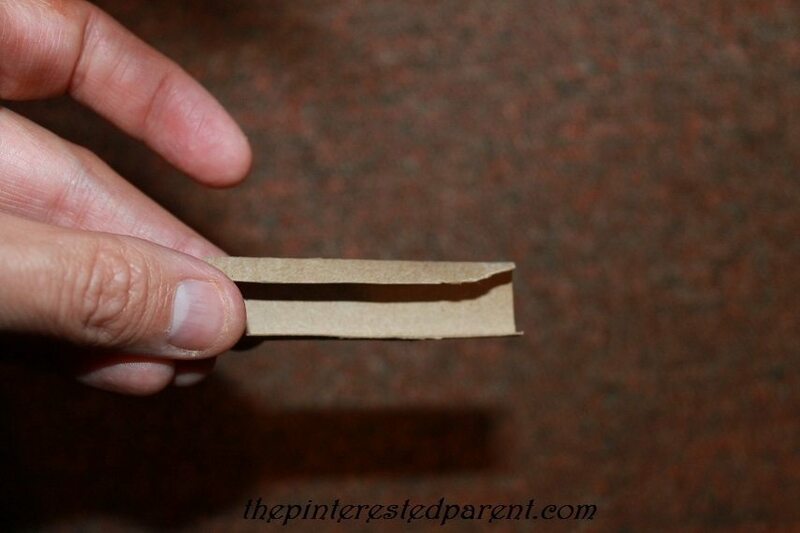 Tape the edges in place to hold the shape tightly. 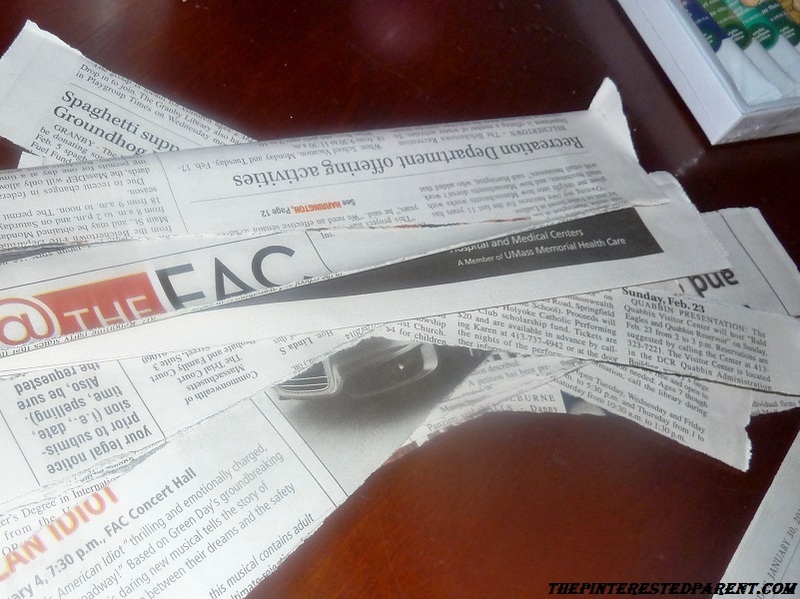 Enlist the help of your favorite little crafter to tear up strips of newspaper for you. 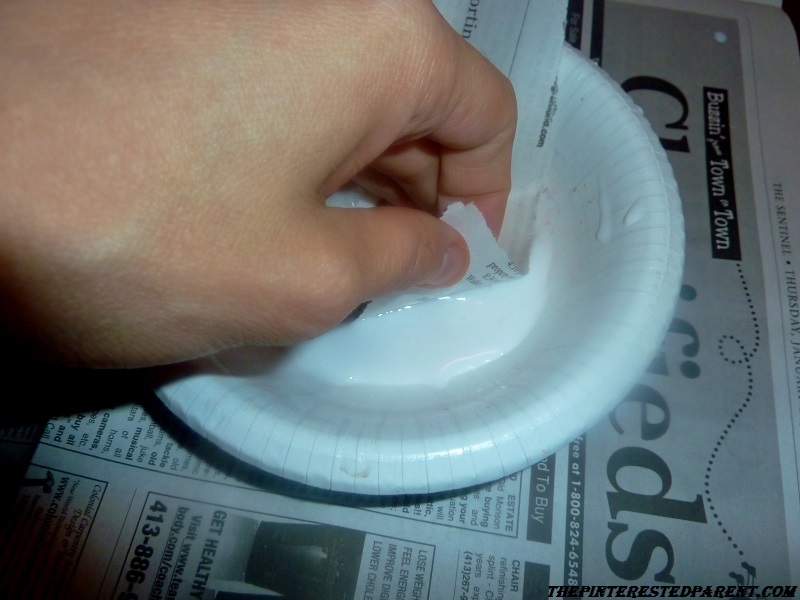 In a bowl, mix 3/4 glue and 1/4 water to form your paper mache adhesive. 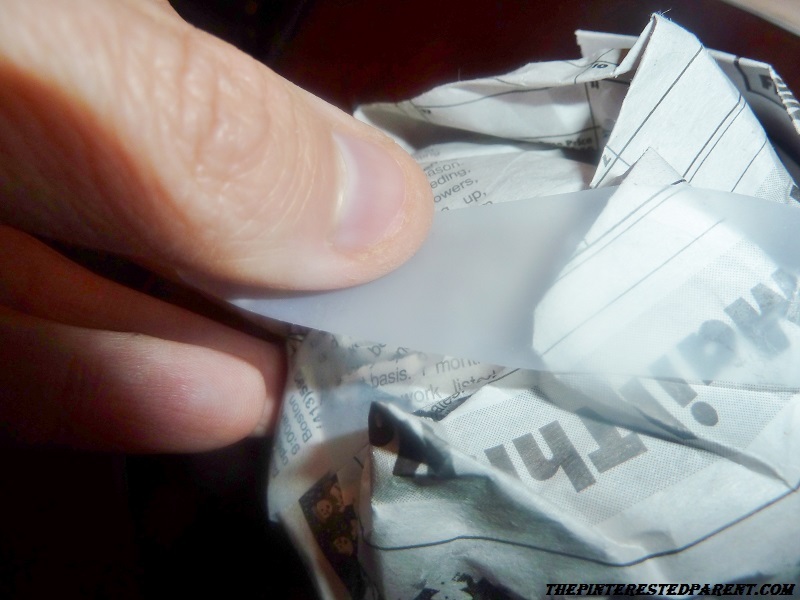 Dip a strip of the paper into your glue mixture. 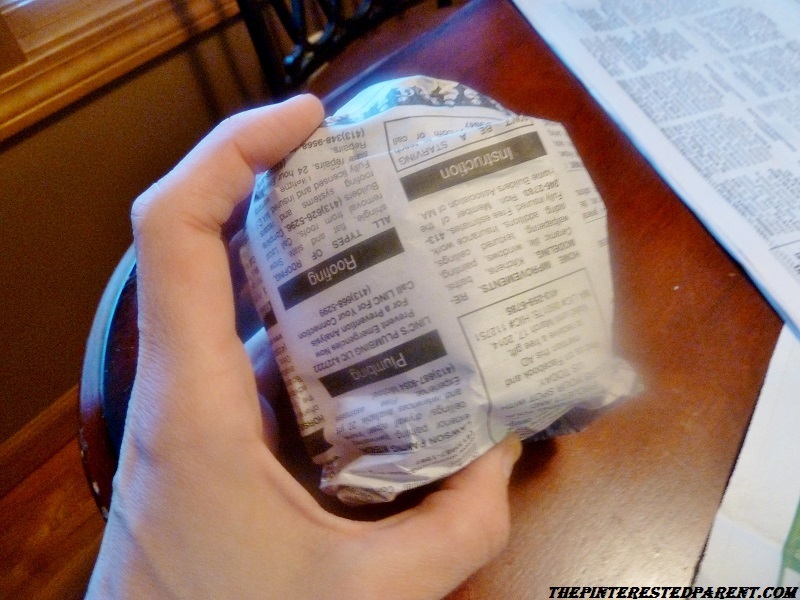 Wrap your strip of paper around your ball shape smoothing it out carefully as you work it around. 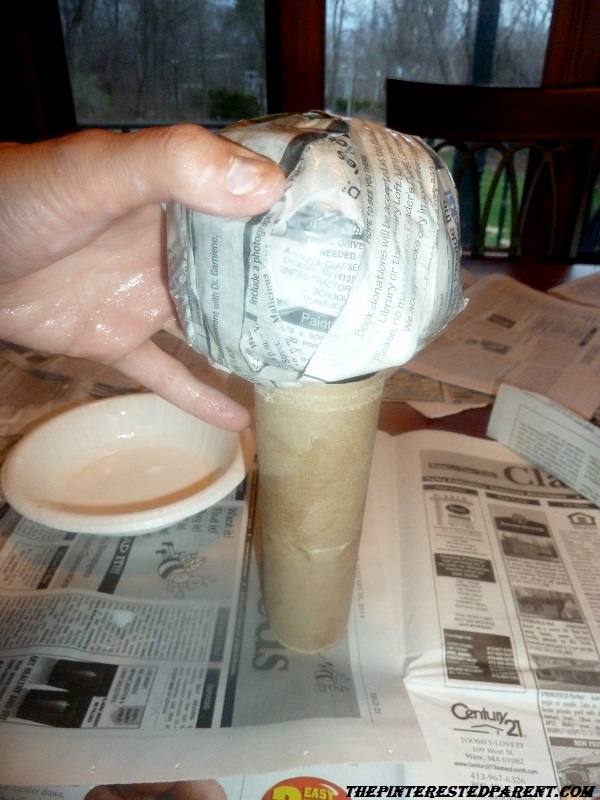 After you receive a desired shape, allow it to dry & then place your ball on top of the paper towel tube halve. 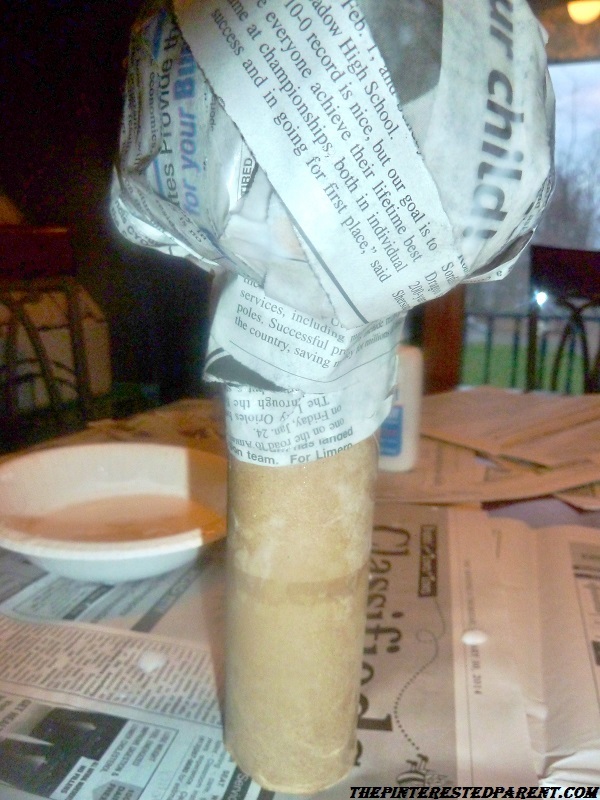 Adhere the ball to the tube using masking tape & then cover the tape with more newspaper strips. 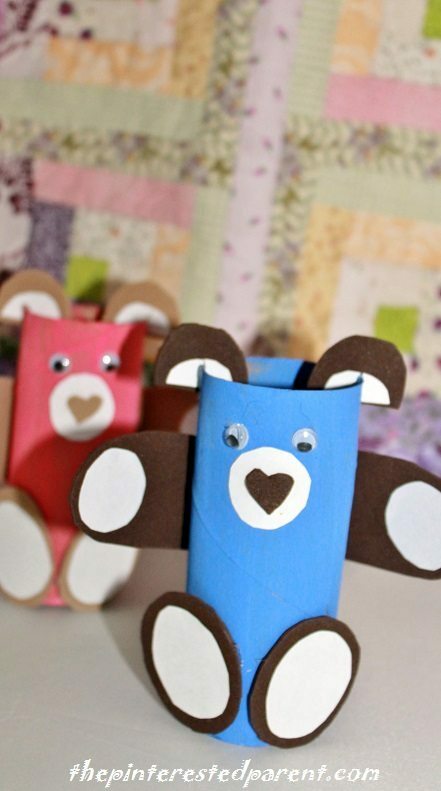 Continue to wrap your project with the paper strips and glue until you reach the desired shape. 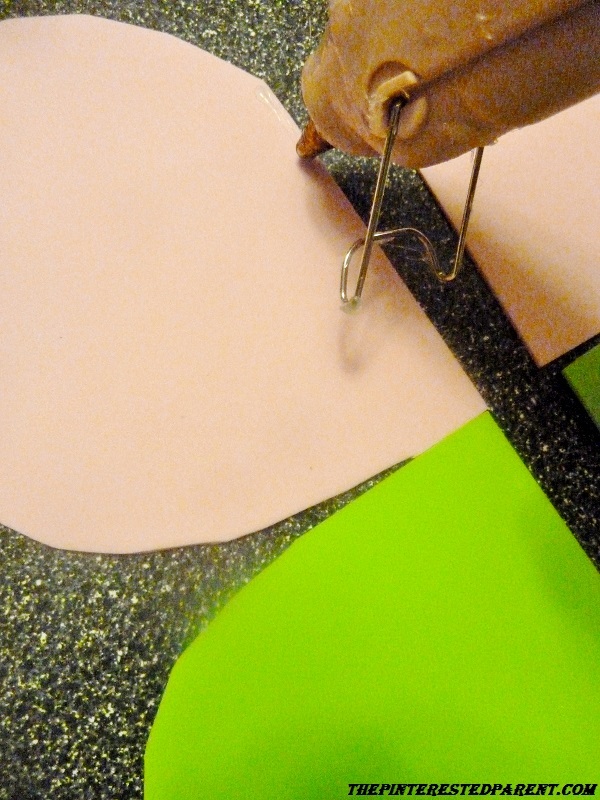 Make sure that all areas are smooth and that edges are not sticking up. Let it dry. 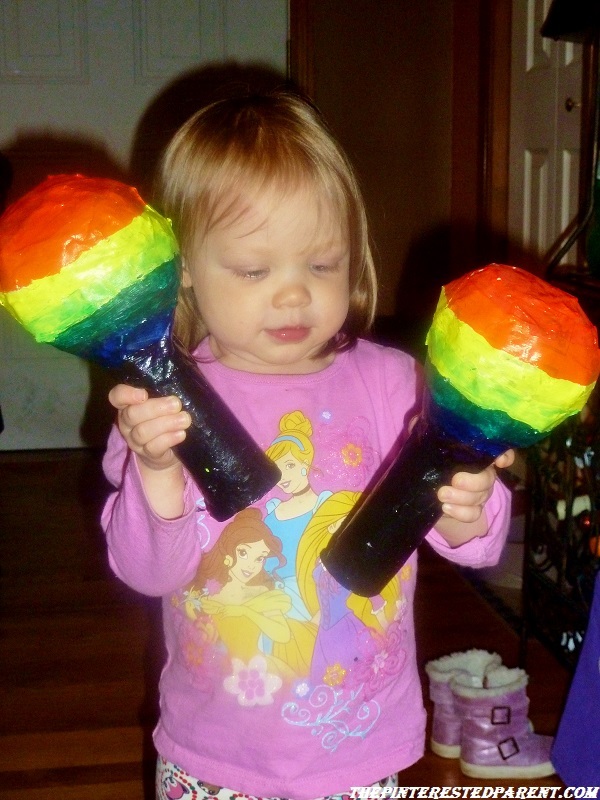 Paint the handles of your maracas first in the color of your choice and allow to dry. Once dry, continue to paint the rest. You may now use the handle to hold on to while you paint. 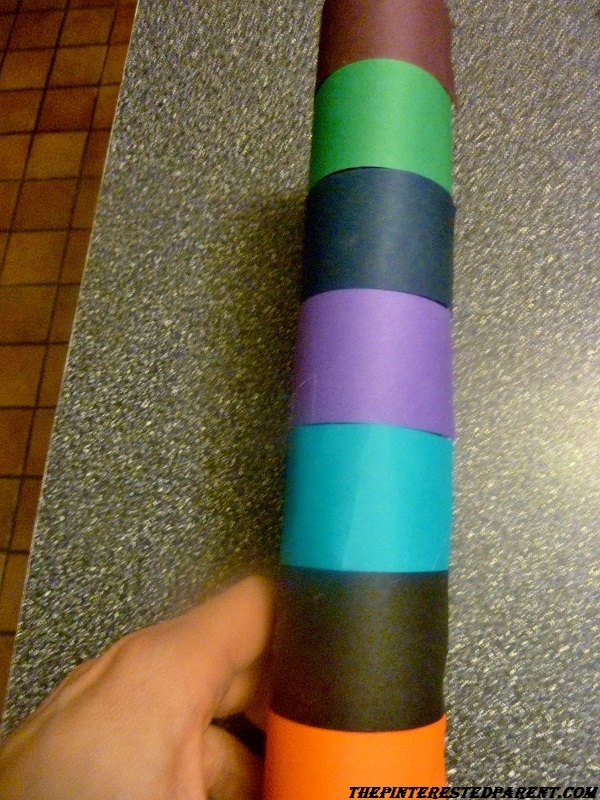 Cut out two pieces of plastic small enough to fit snuggly inside of the paper towel tube. 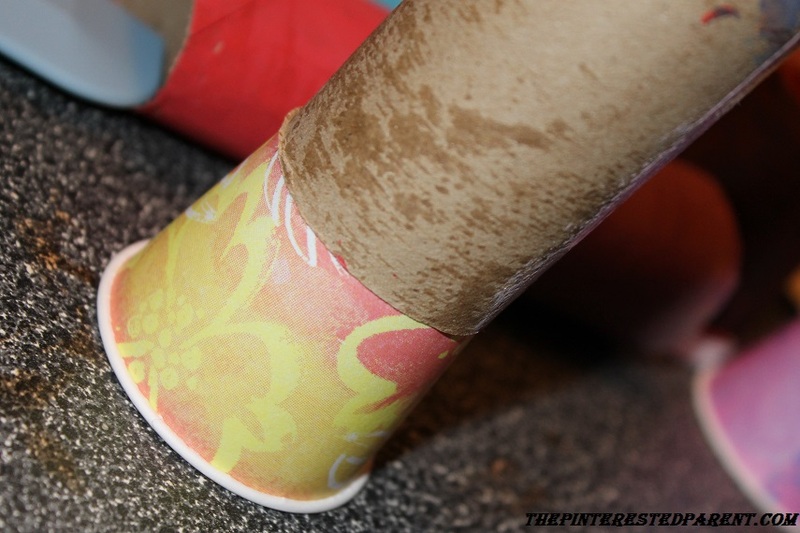 As deep in the tube as you can, use your glue gun and squeeze out a line of glue rotating until it meets the starting end. 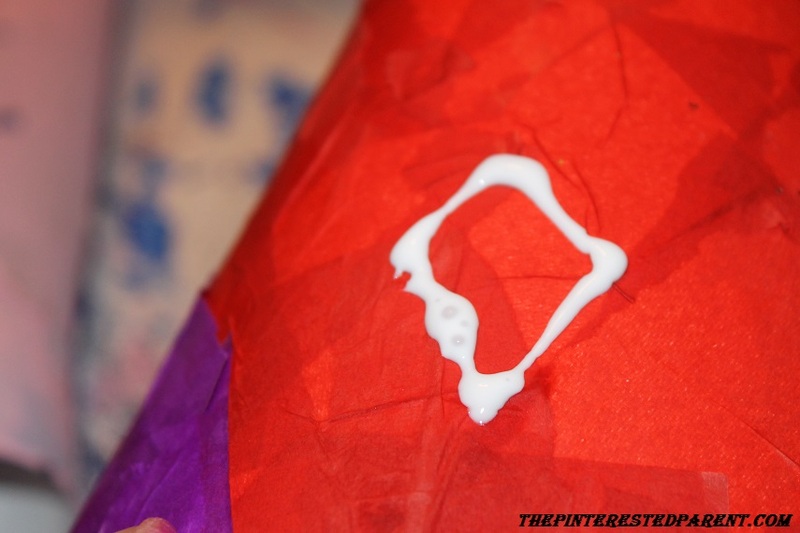 Give it a few seconds to cool slightly and then press your plastic disk into the glue. Pour the beads on top of the disk, leaving enough room for the beads to move around. 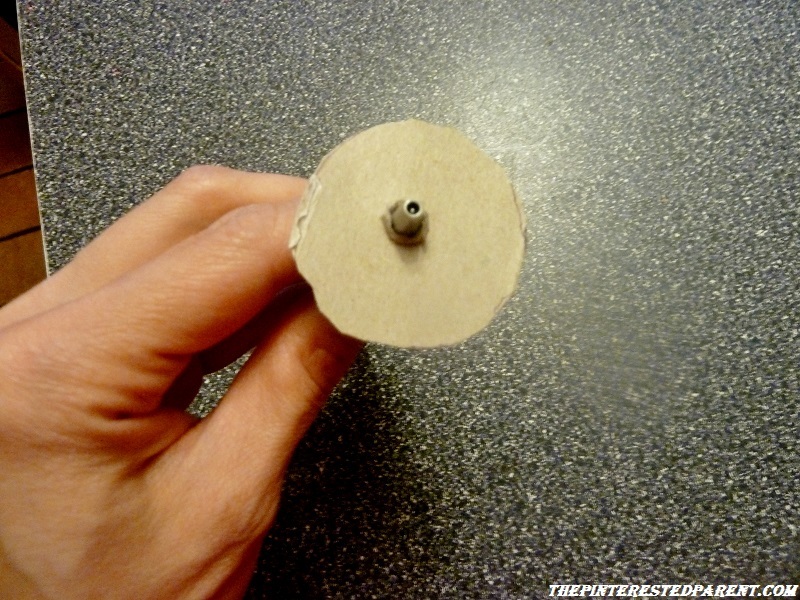 Add hot glue to the top edge of tube over the beads and place the other disk in place. 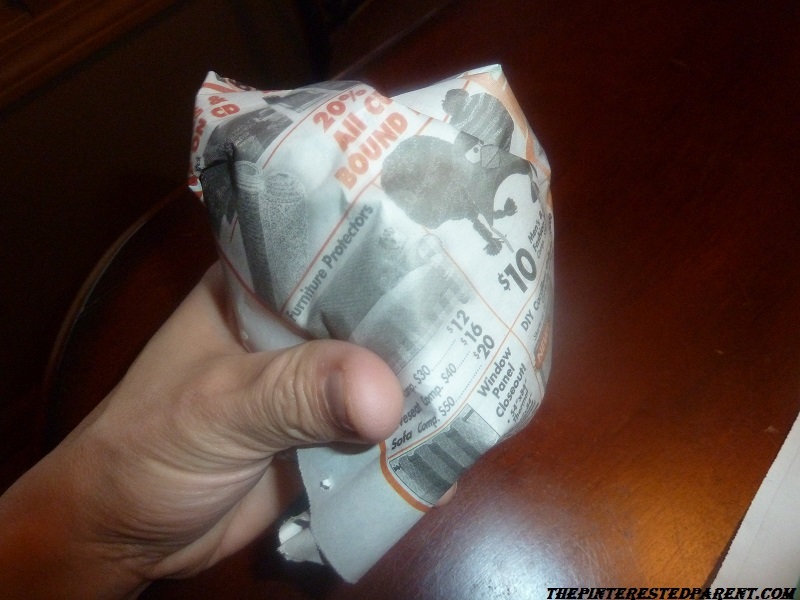 Fold a piece of tin foil into a triangle. 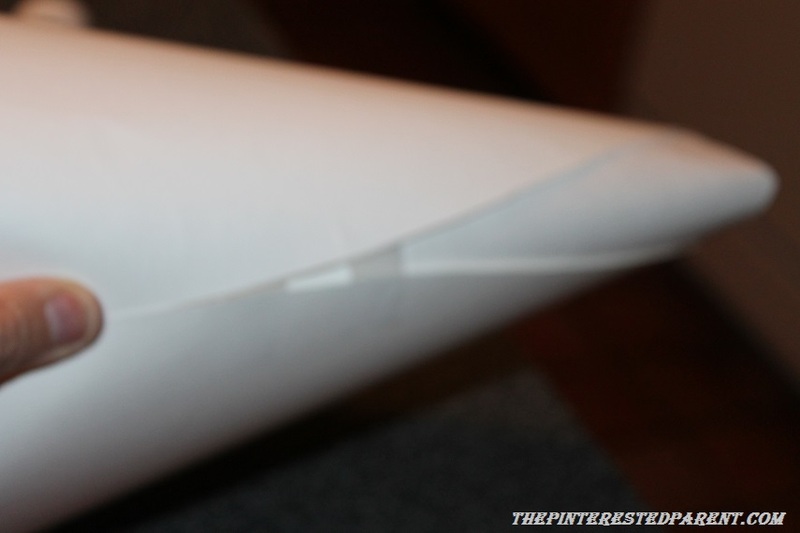 Push your triangle into the open end of the tube. Trim the end as needed. Make sure to reform the shape. 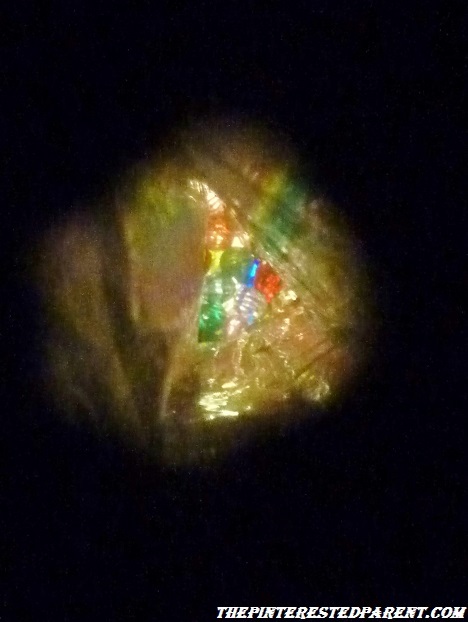 It will work best if the triangle has crisp, hard edges. 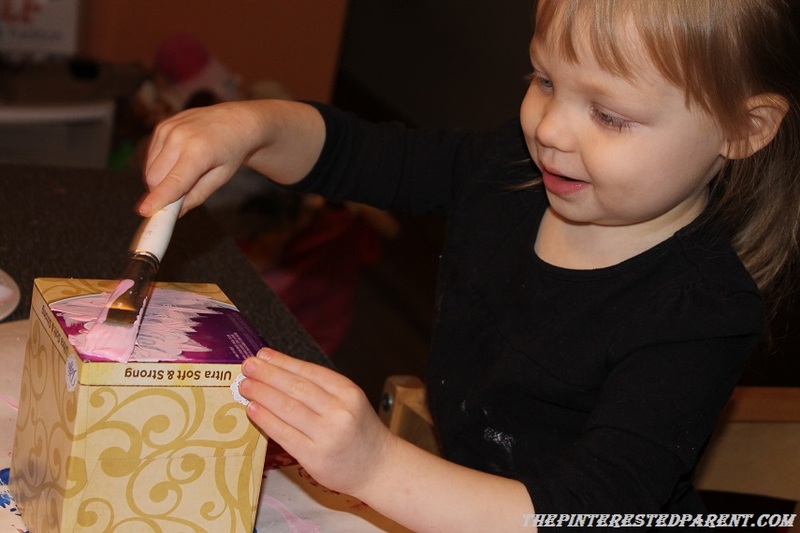 Cut out another disk using cardboard or thick scrapbook paper. 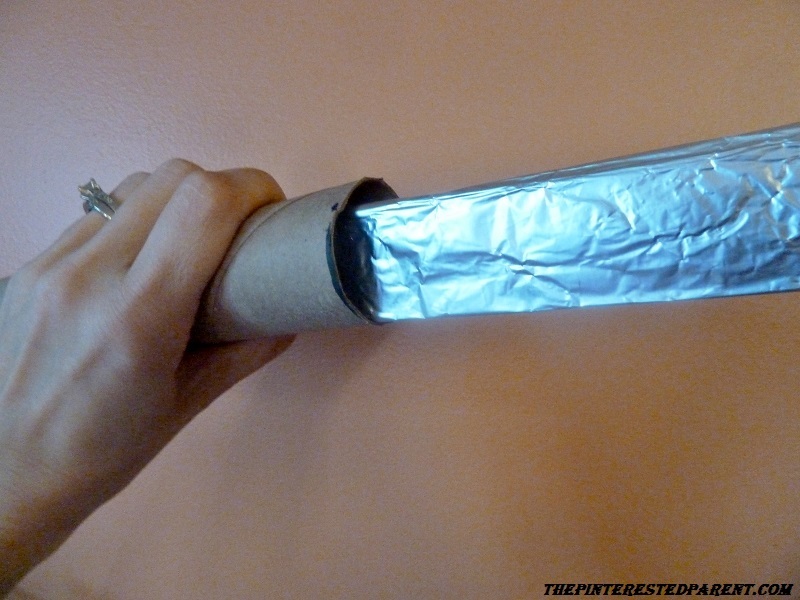 Poke a hole through the middle of it & glue it to the tin foil end. 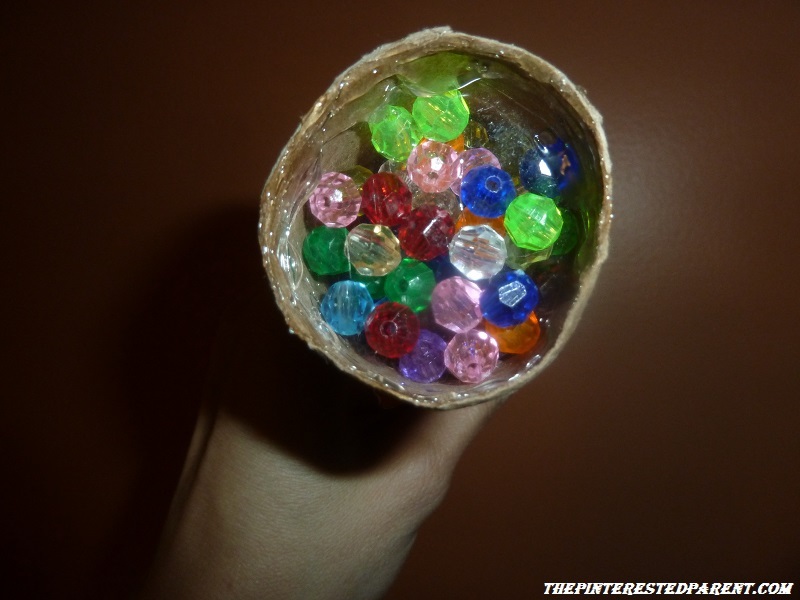 I wrapped my kaleidoscope in craft paper, but you can decorate however you like, paint, crayon, beads, ribbon. Not quite like the real thing, but it still is fun to play with. This was a pretty simple one. 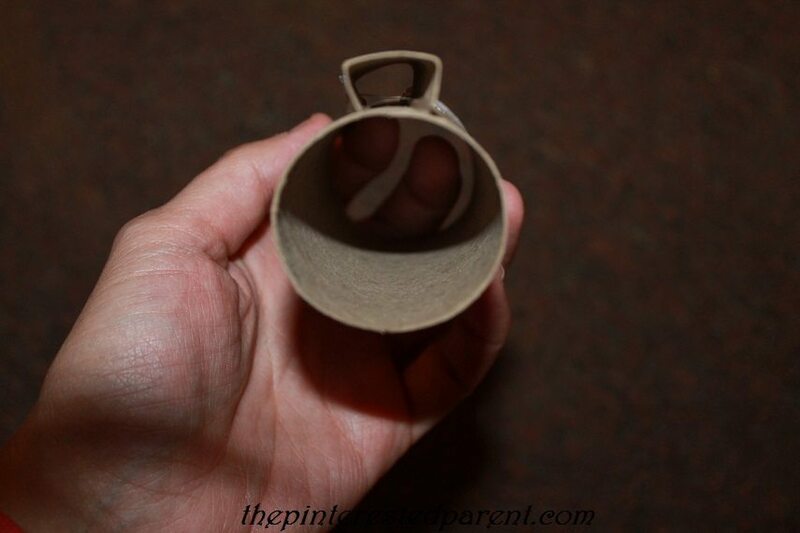 You could also do this on a smaller scale with a toilet paper roll. 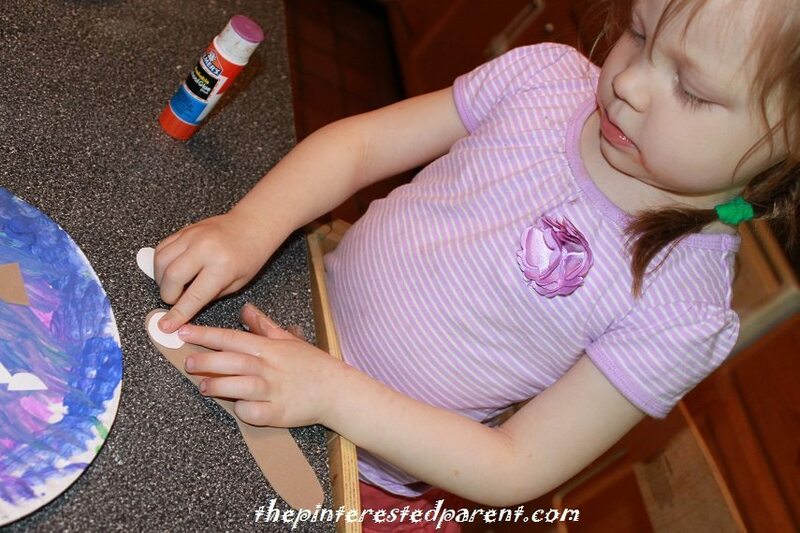 Cut out foam pieces in the shape of the wings. 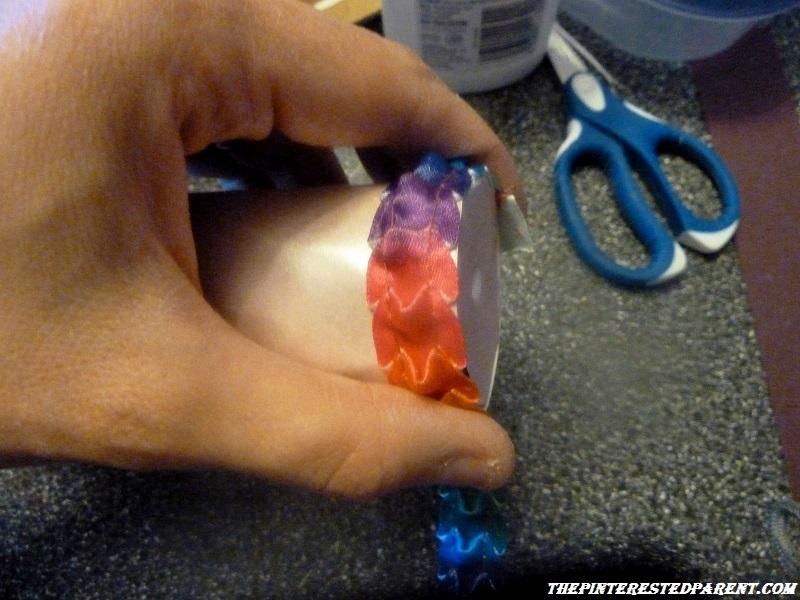 Using different colored scrap strips, wrap around the tube and glue using the hot glue gun. 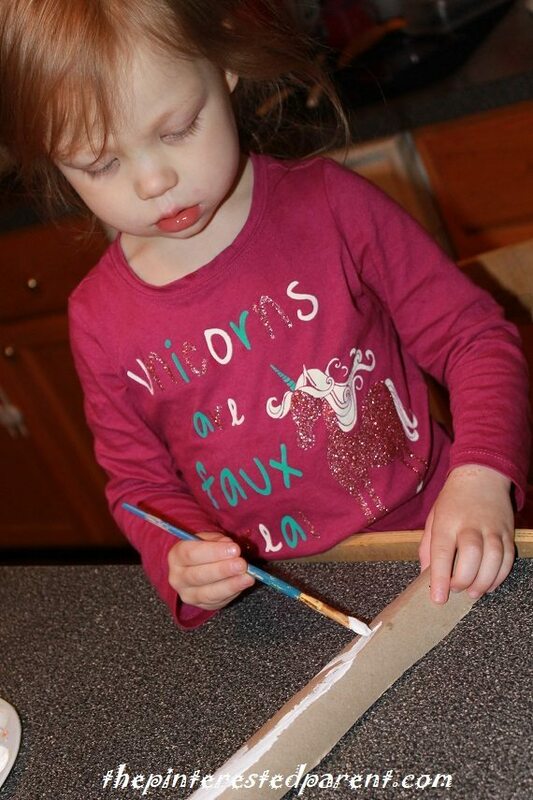 Run the glue gun along the edge of the wing where they should meet with the paper towel tube. 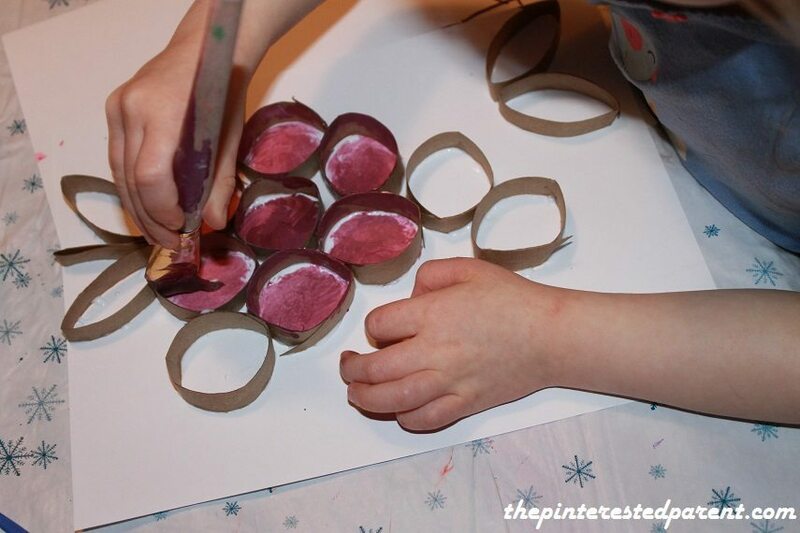 Pour some glue into a paper bowl and let your munchkin dip the pom poms in and glue to the butterfly. 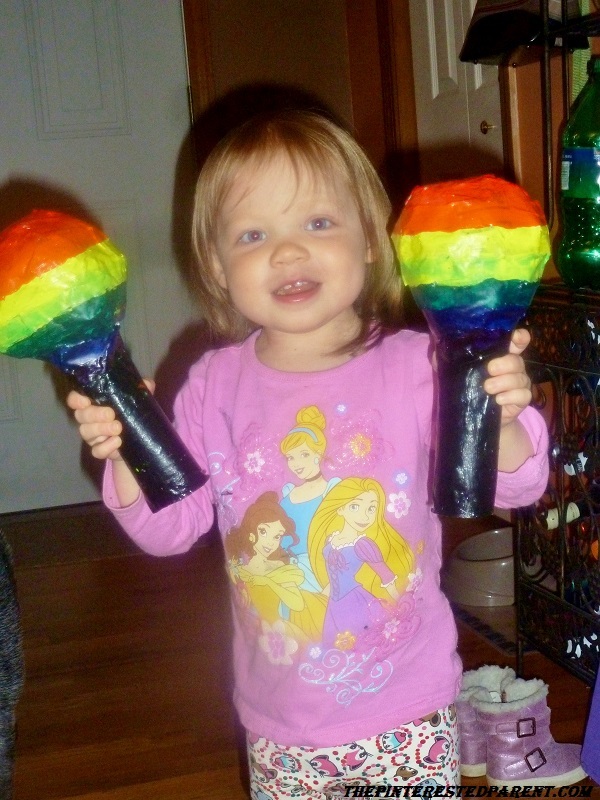 Mai decides it is way more fun to stuff the pom poms in the tube than to decorate with them. 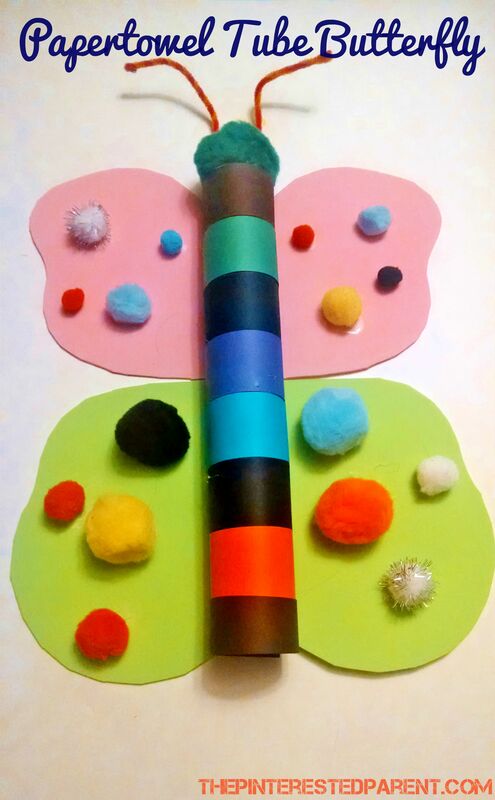 Glue one large pom pom to the top for your head & use pipe cleaners to make antennas. Let dry and your craft is done.